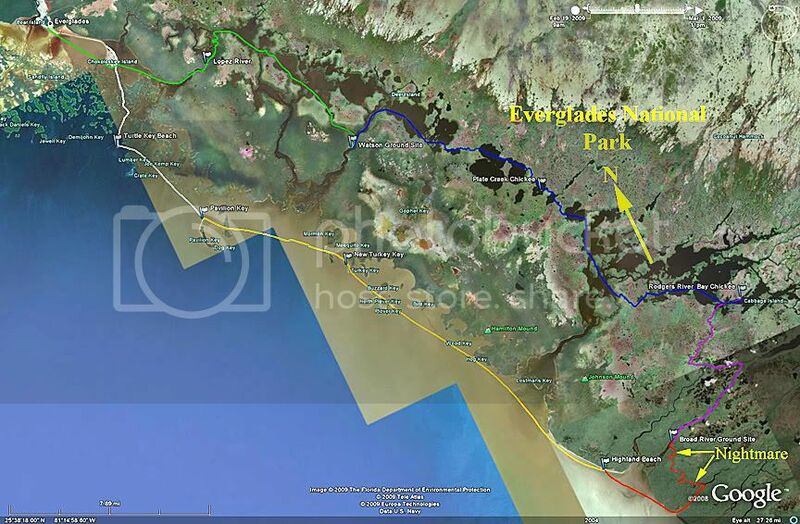 Post subject: Google Earth Pro Maps of Everglades? 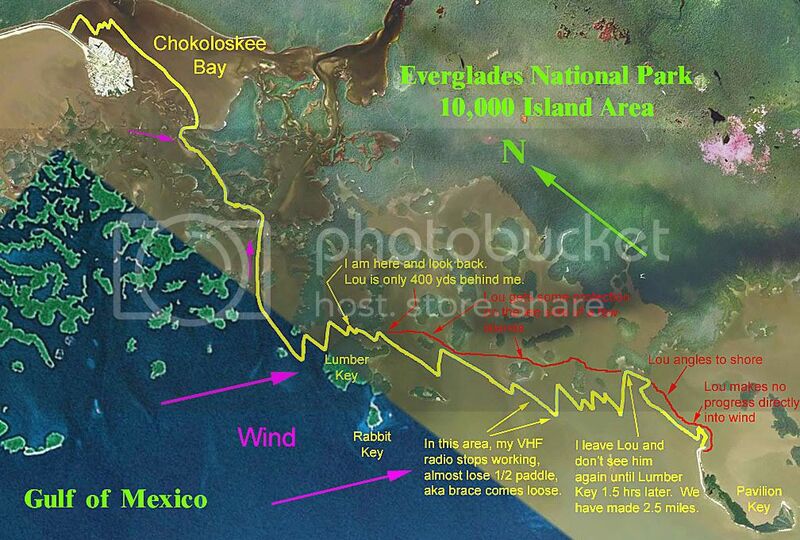 Chekika displayed some Google Everglades maps with GPS tracks overlaid. I assume that these maps were created using Google Earth Pro software? If so, is the $400 annual fee worth the cost? I don't know if I could justify an annual fee equivalent to a mid-priced GPS unit. Wow!! you really do have some great adventures in your AI. 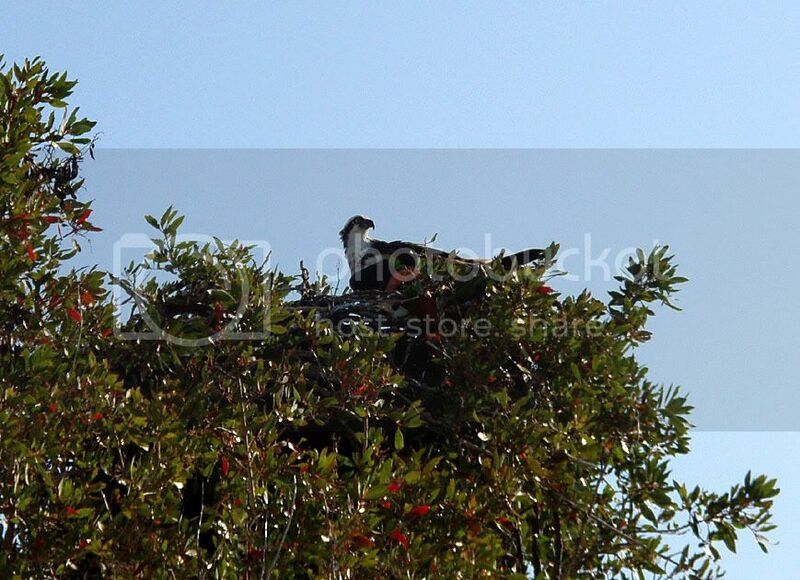 I Must acquire a water camera or a case that will allow for pictures with a regular digital camera. Really great to see all of the Pictures with great descriptions and map shots too. 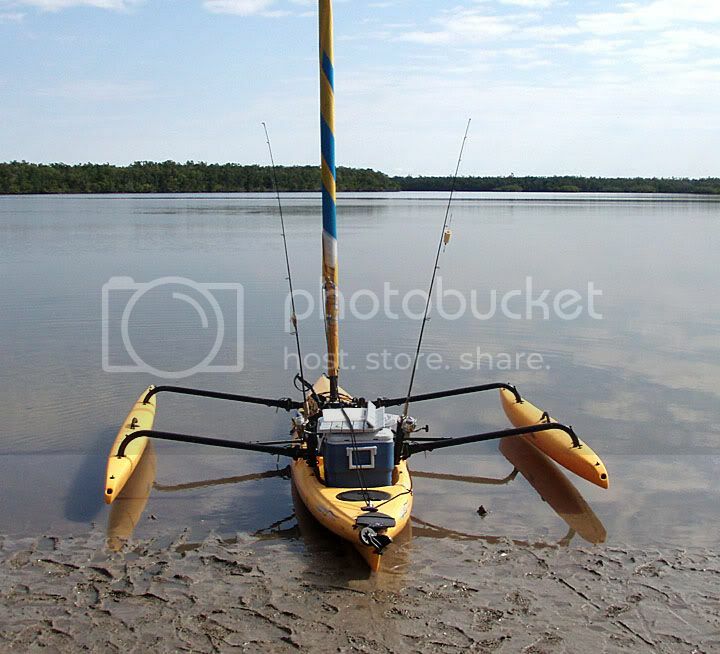 Really motivates me to get my kayaker buds to gear up for some spring camping excursions. What about the front hatch seal has failed? Thanks for sharing!! Great trip report as usual Keith! 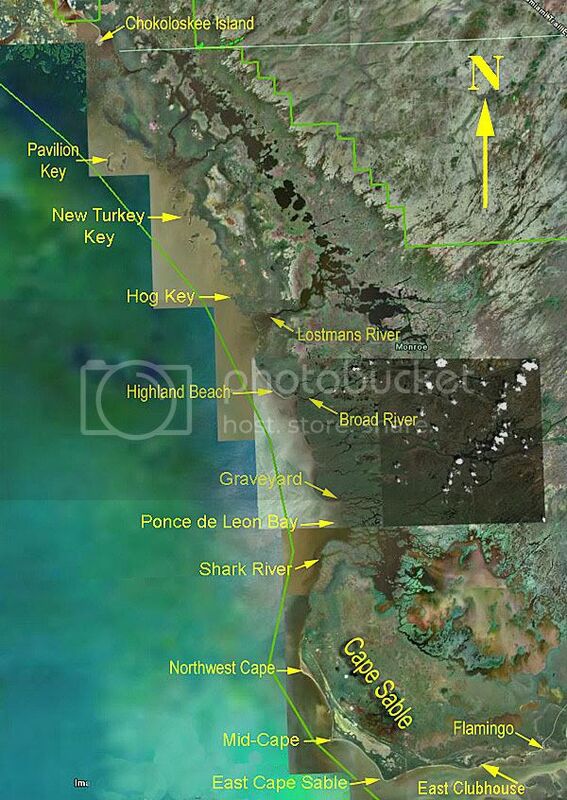 Tidalwave -it's not necessary to fork out big bucks to get track overlays in Google Earth. Look for a GPS that can save tracks as .KML files. These work with the free version of GE. Even my Nokia GPS phone can do this. No, Titlewave, I am a $20/yr Google Earth Plus user. I think the GPS upload of tracks & wpts is one of the "Pluses" you get w/ Google Earth Plus. I have recently received a communication from Google saying they were discontinuing Plus--BUT, that they intended to incorporate that GPS track upload feature into their free version in the near future. At the same time, they offered me an upgrade to the $400/yr version for $90 the first year. At $400, I can't use the commercial version, so like you, I will be using the free version. They did say I could countinue my "Plus" version free for 3 mo. In a follow-up they say I can continue to use "Plus" free until the GPS features become available in the free version. Unfortunately, for now, the Plus is no longer available--it is either free (w/o GPS feature) or $400. Google is a great company. Google = great. Stringy, that is a good to hear some GPS devices can save .KML files. My 5-yr old Garmin 76 cannot. 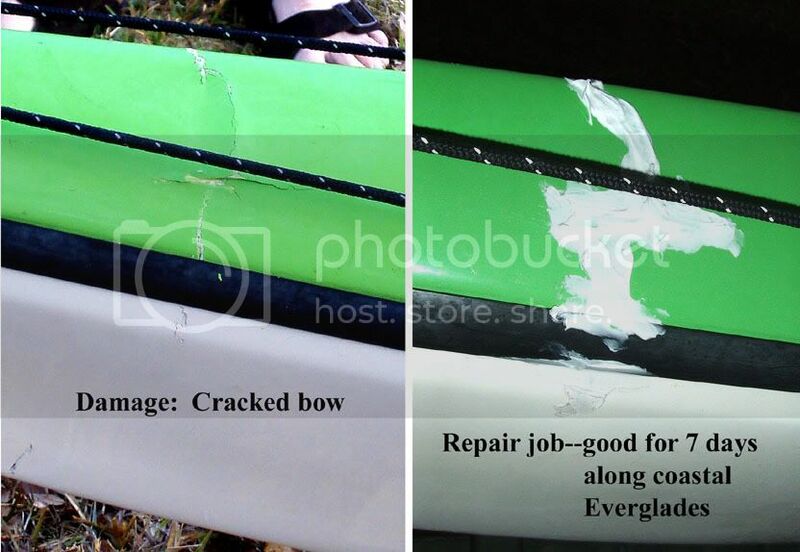 Element, the seal (rubber tubing) attached to the hull front hatch opening has broken down--about an 8" stretch on the starboard side of the opening. It has disintegrated. The seal on the hatch lid is ok at this point. I am thinking of putting in some additional seal in the bottom of the mote around the front hatch opening. The intent would be for the hatch lid seal to mate with the mote seal. I may also replace the bad section of the opening seal. This edge seal acts as a second seal in case the lid/mote seal leaks. 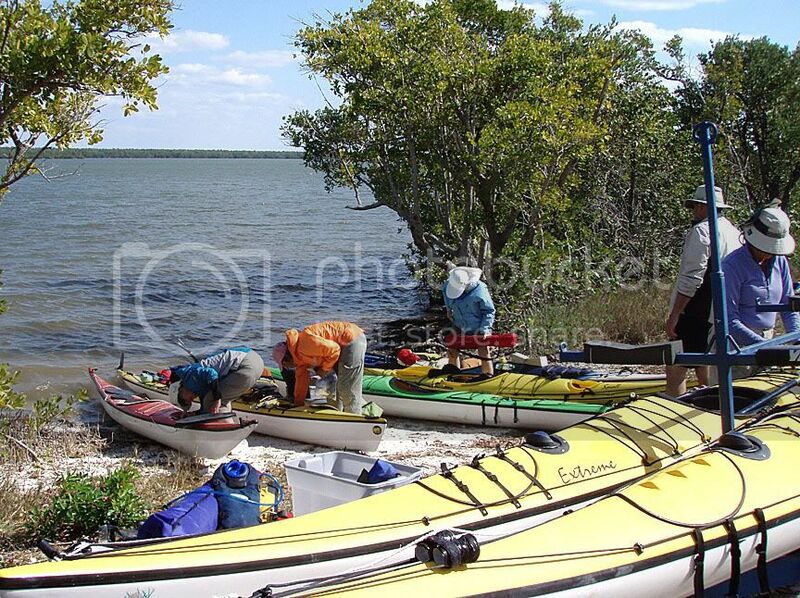 Saturday, Lou Greenwell and I were first in line at the Everglades City Park Headquarters to get a permit for Pavilion Key, but it was full—the tourists were out in force. Sunday, Monday, Tuesday and Wednesday were available on Pavilion so we took those days. Having a day to kill, we played tourist. 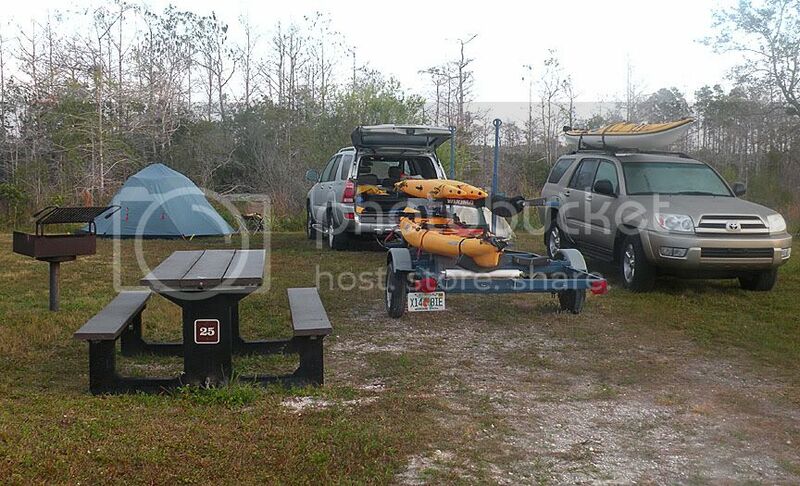 First we drove west 15 miles to Collier-Seminole State Park looking to camp but it was full, so we turned around and came back east about 25 miles to Monument Campground in Big Cypress National Preserve. 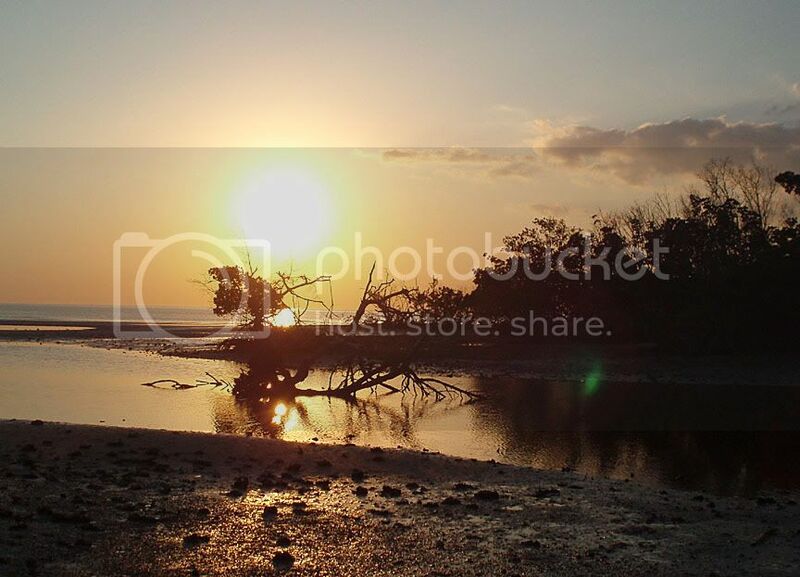 In between, driving on Tamiami Highway, we stopped a dozen times to take pictures. Here is the fruit of our work. 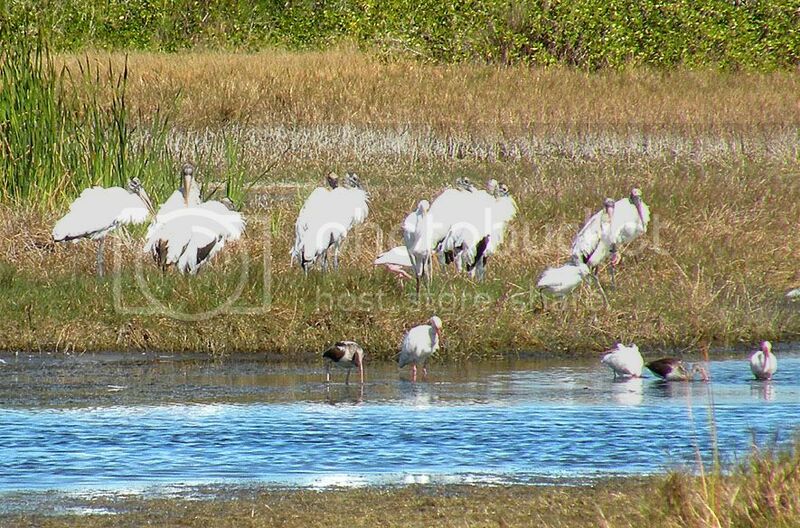 Woodstorks in the background and Ibis in the water (the 2 dark birds in the water are juvenile Ibis). 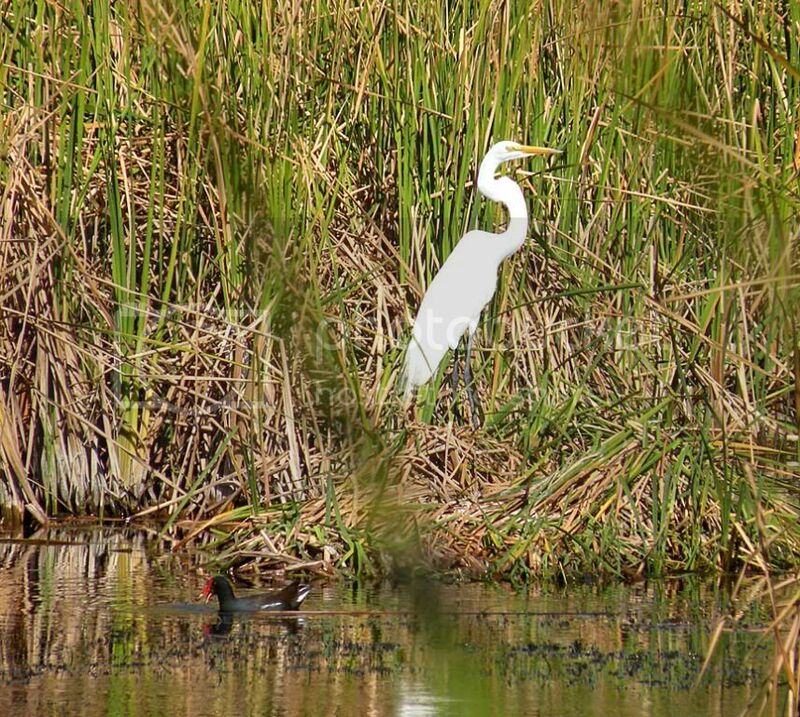 There is a Snowy Egret and an Ibis in the center of the Woodstorks. 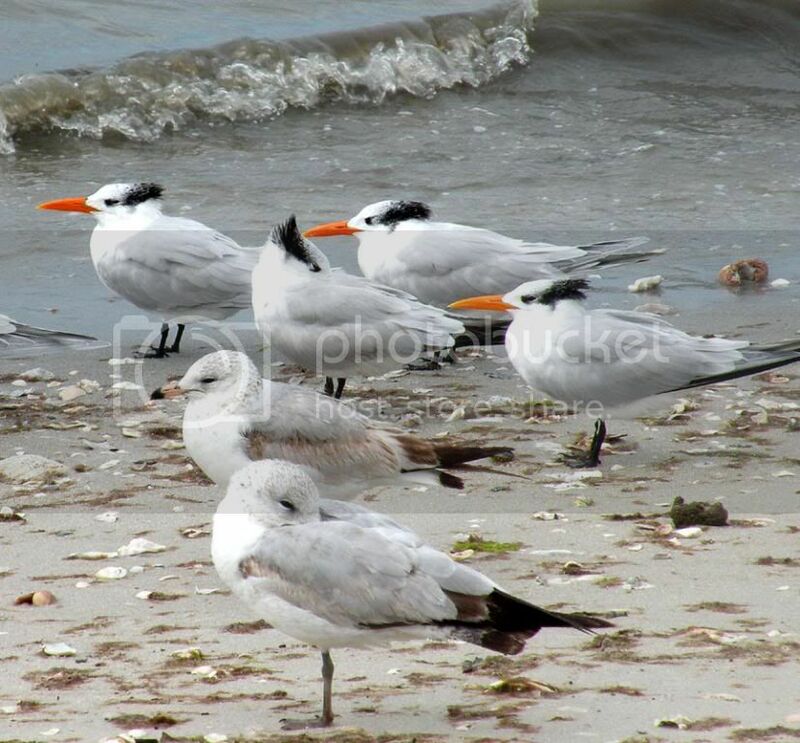 Thanks to my good friend and birder, Ms. Roxanne Featherly, for help identifying these birds and others. 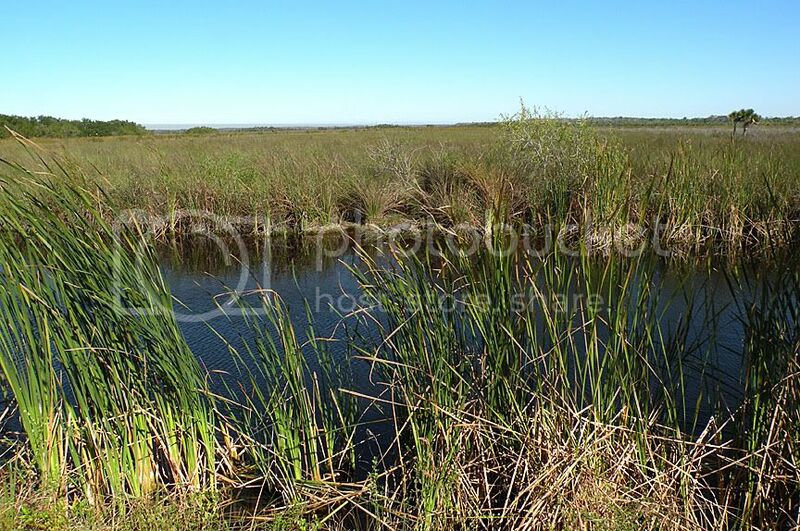 Typical marsh grass scene in Big Cypress. 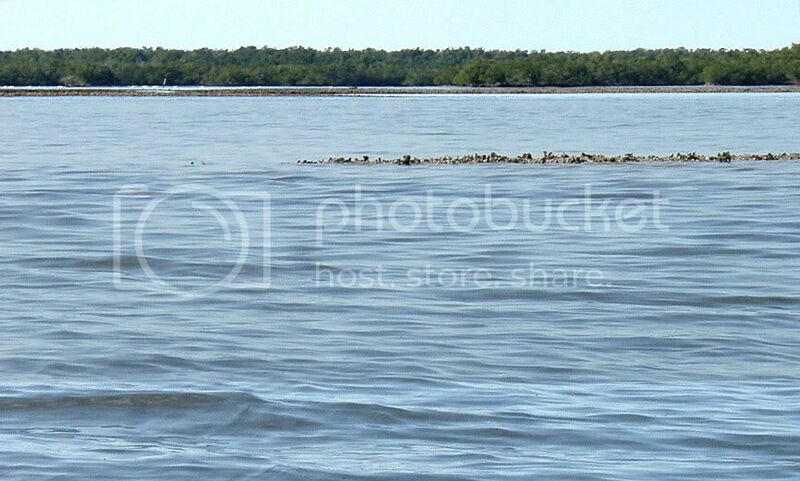 Can you find the alligator in the picture? Another group shot. 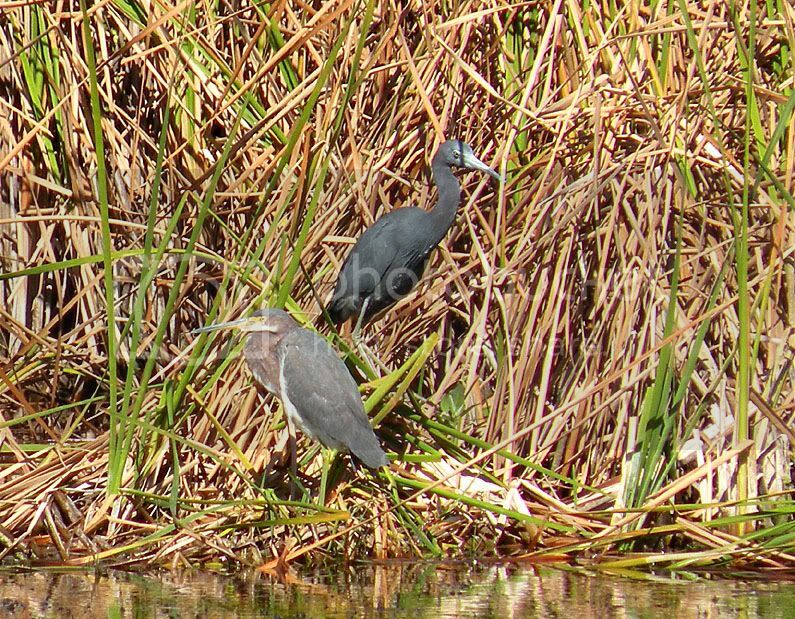 From left to right, Ibis, Cattle Egret, Little Blue Heron, Tri-colored Heron, and a Great Egret. Lou and the author playing tourists. 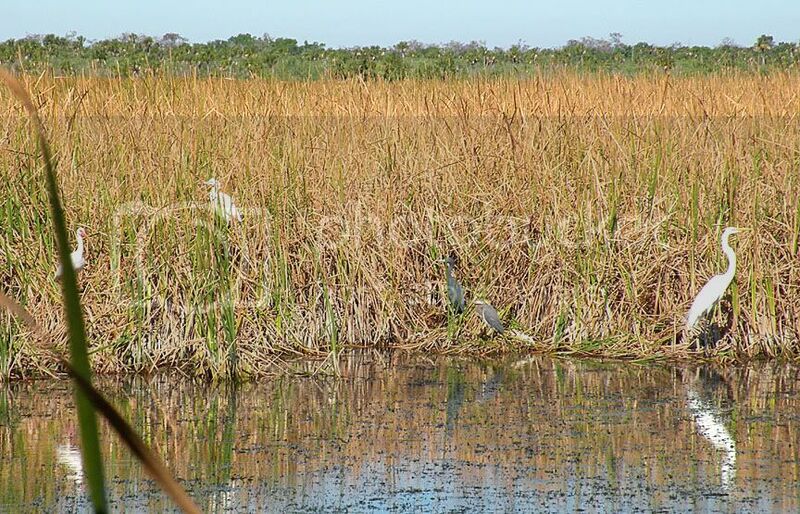 Note alligator just below center in picture. 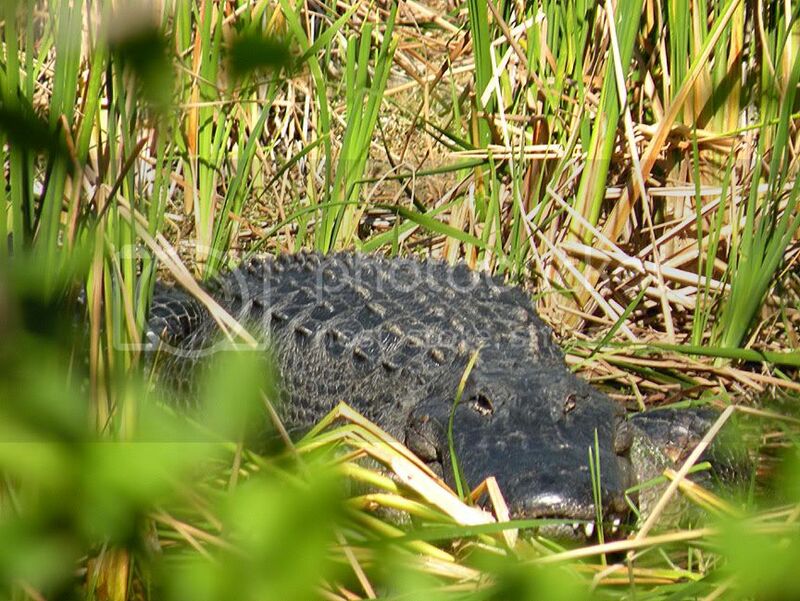 This was a cool day in S FL, so cold-blooded alligators like to sun themselves on the edge of creeks and ponds. Breaking camp on Sunday morning. 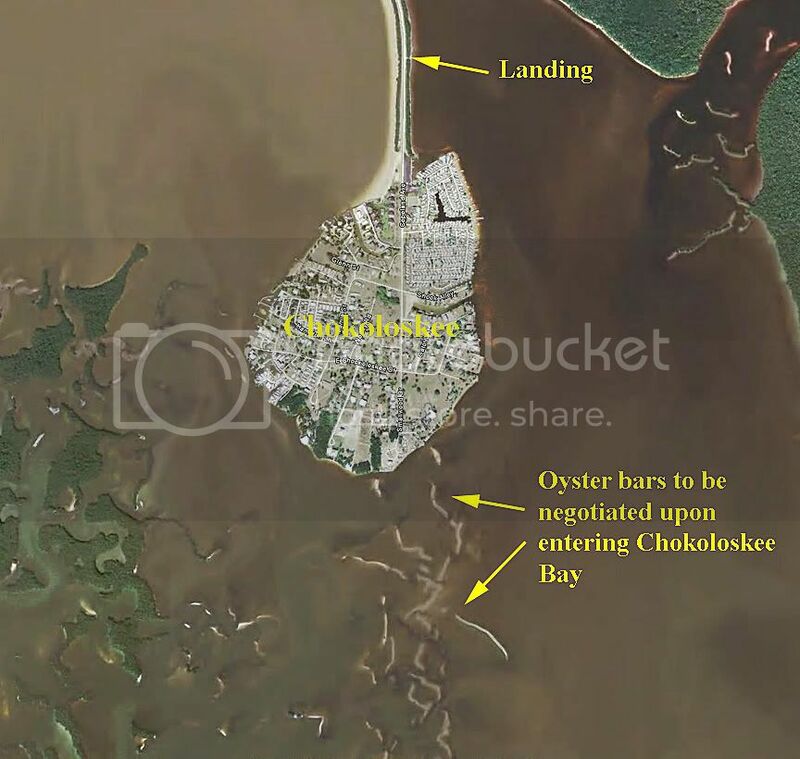 We will head over to Chokoloskee and then out to Pavilion Key. Finally loaded—2 hrs late! And where is the wind?? 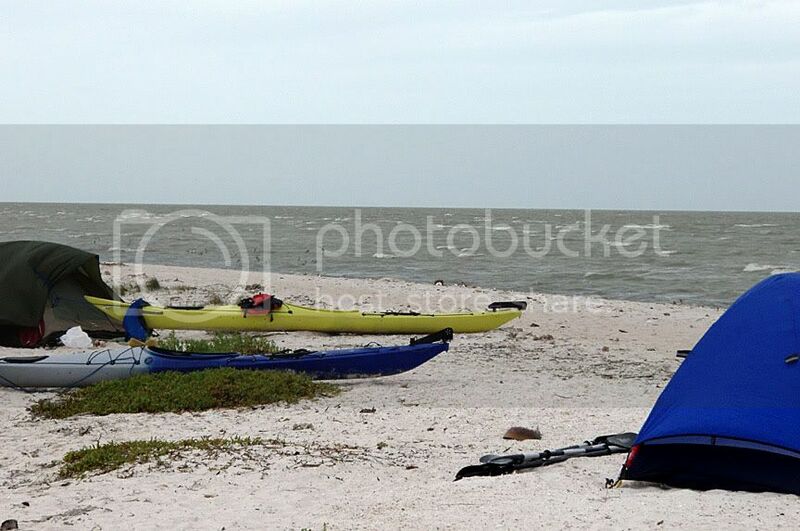 The tide is fast draining out from under my Hobie Adventure Island. 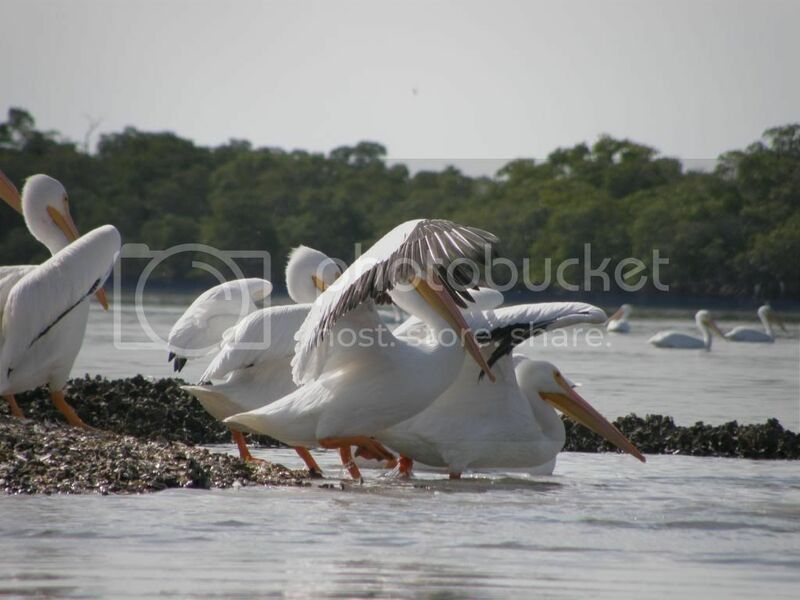 Lou paddled near these migrant White Pelicans. 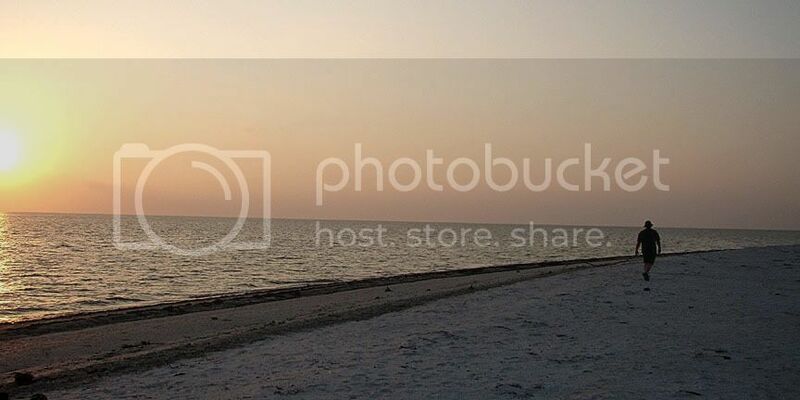 Once I reached the waters of the Gulf of Mexico I had no wind—just light ocean breezes. 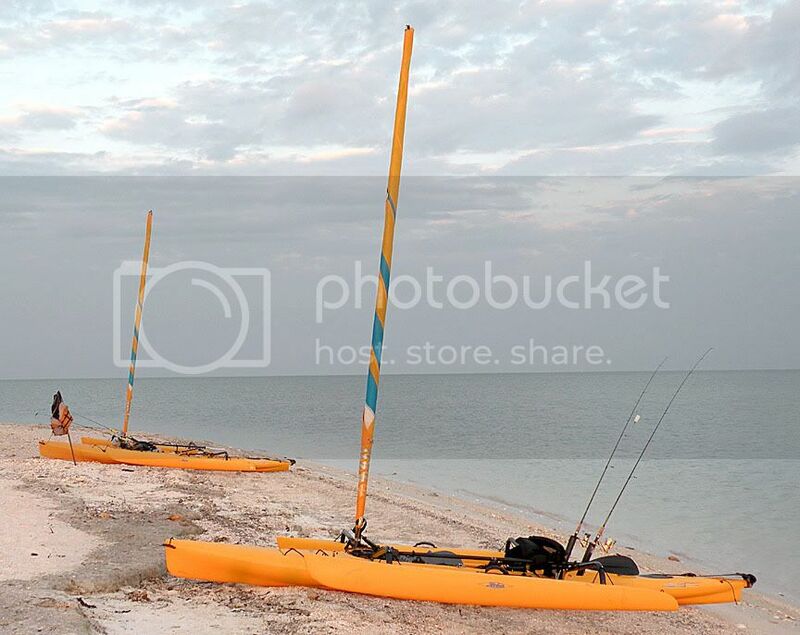 These times are made for the Hobie Mirage Drive. 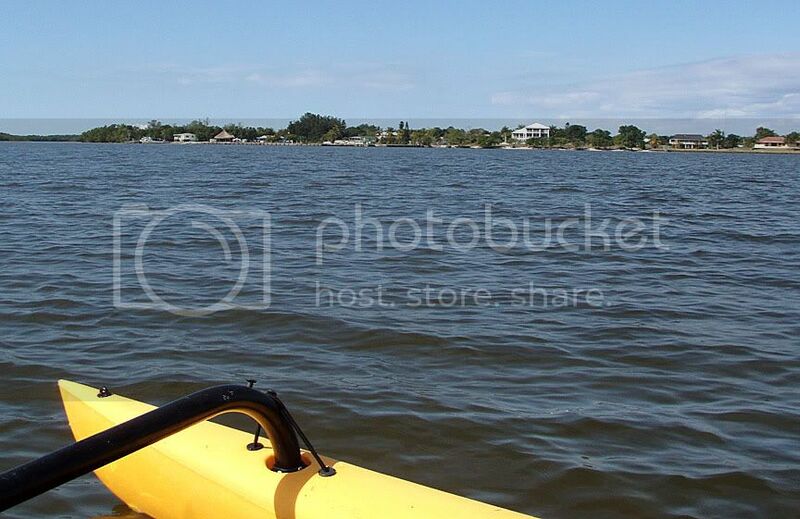 Pavilion Key is 4 miles away. The clouds hanging over the mainland to the north portend a cold front moving in tomorrow. Of course, I want to introduce the Pavilion Key manager. He also handles the security. 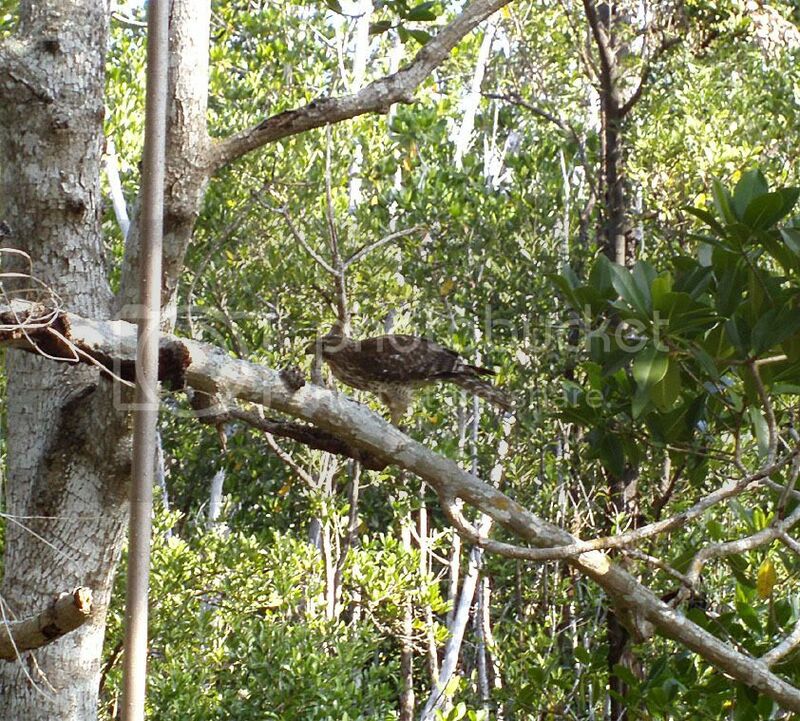 Frequently when we stepped away from our camp, he was on lookout sitting on my chair back or on the peak of my tent. 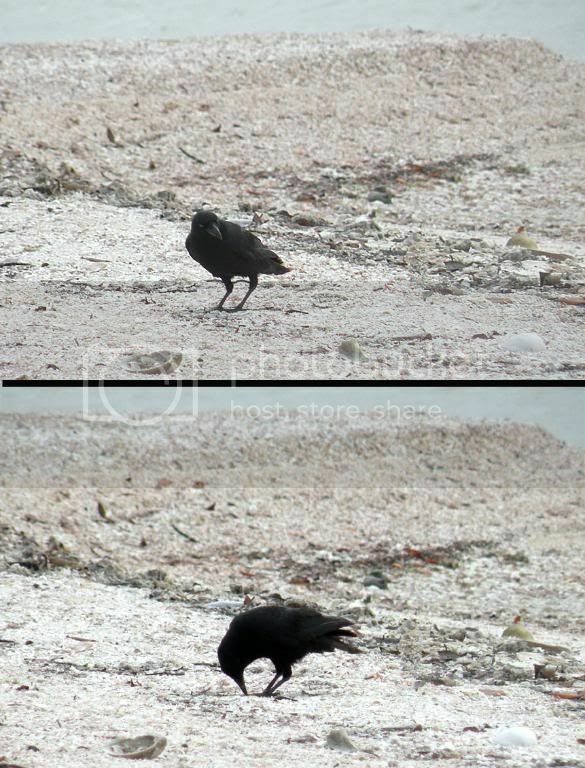 Here he is checking beach conditions. King of the Hill and the wannabe. 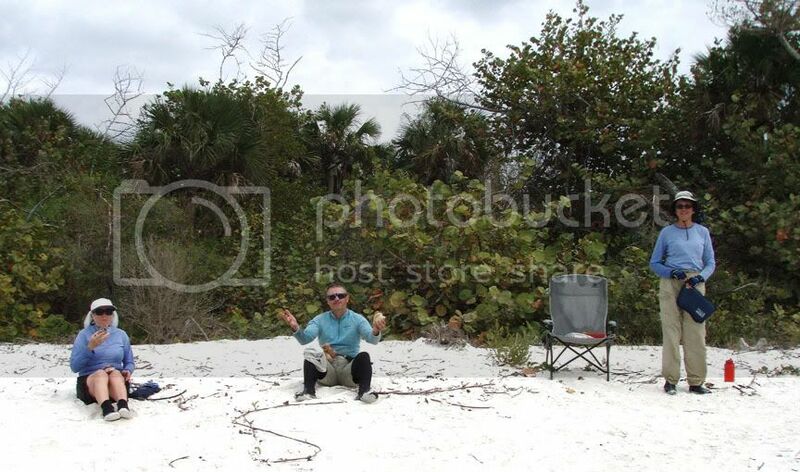 Lou got this picture of The King enjoying a bit of fish carcass we put on the beach. Lou is frying some beautiful filets for fish sandwiches. Gus and Tini. (Gustavo is Brazilian and Tini is German.) It is cold today (Monday) so they dress accordingly. Yesterday, when I sailed (pedaled) up to Pavilion, they excitedly greeted me in their bikini bathing suits. Tuesday: the front is moving through on schedule. Because the weather is worsening (it is going to be cold and fishing will be terrible), we have decided to forgo our 4th day on Pavilion and head back. Lou is packing up on the lee side of the spit. Winds were very strong on the windward side. After I stepped the mast, the wind immediately whipped the sail top out and tightened it around the bottom of the mast. 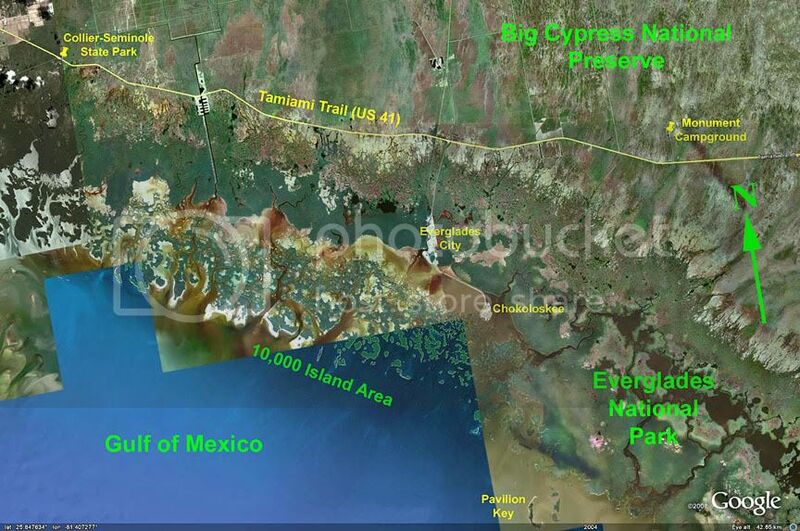 This Google Earth image tells the story of our trip back to Chokoloskee. The winds were between 20-25 mph in our face. My track is yellow. I roughly drew Lou's track in red. 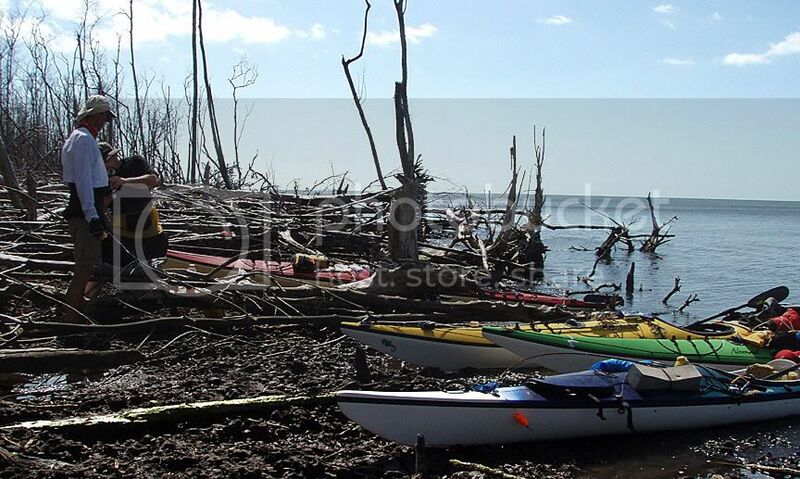 After Lou paddled around the spit, he could make no progress paddling into the wind. 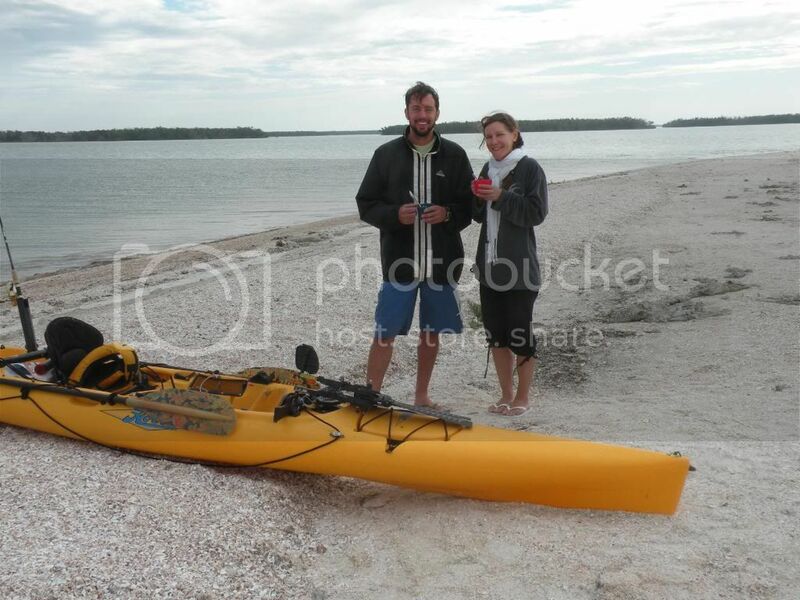 We stuck together as he paddled the mile over to the coastal islands and took shelter. As he began to work his way back, I left him and began slowly to make my way to Lumber Key. 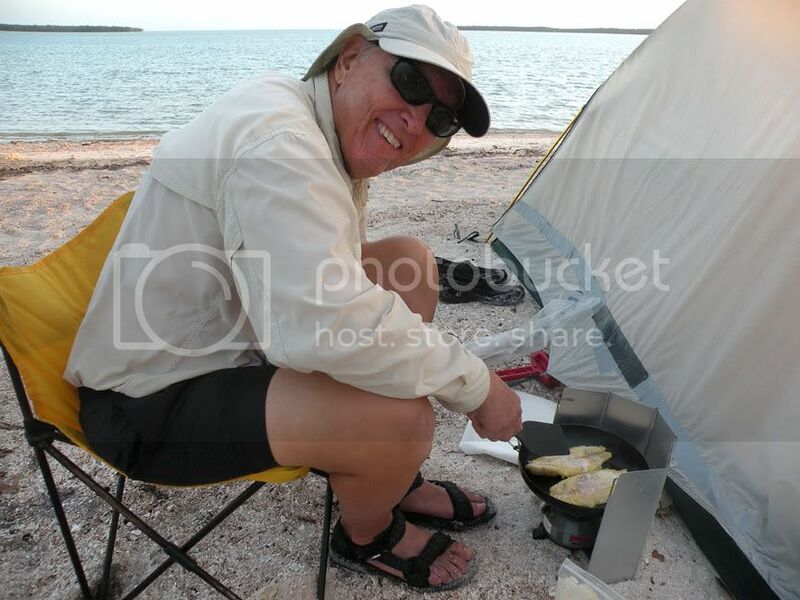 Shortly after leaving him, the waves grabbed one of my paddles (see paddles in Gus-Tini picture.) 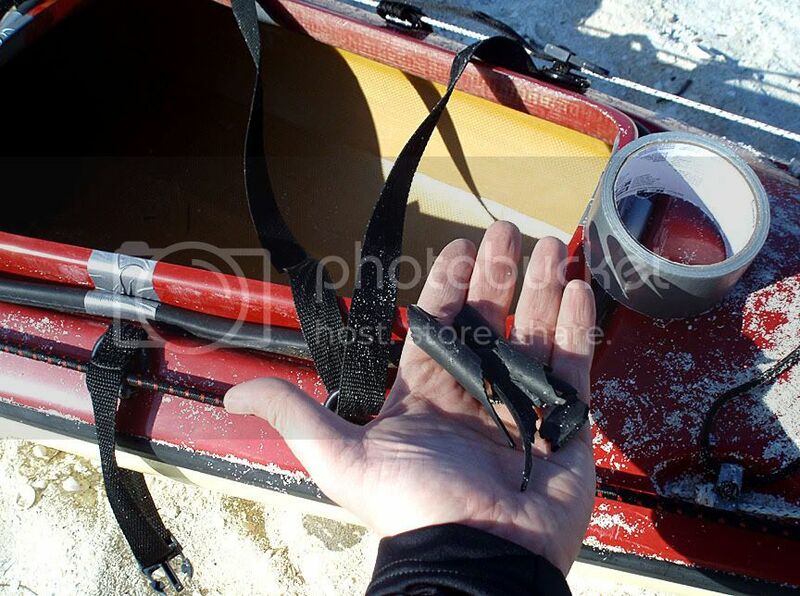 As I struggled to save the paddle, I inadvertently disconnected the aka brace (outrigger brace.) It was a bit hairy for a few minutes. When things were under control, I found my VHF radio had died. At this point Lou and I were out of sight and touch of one another. 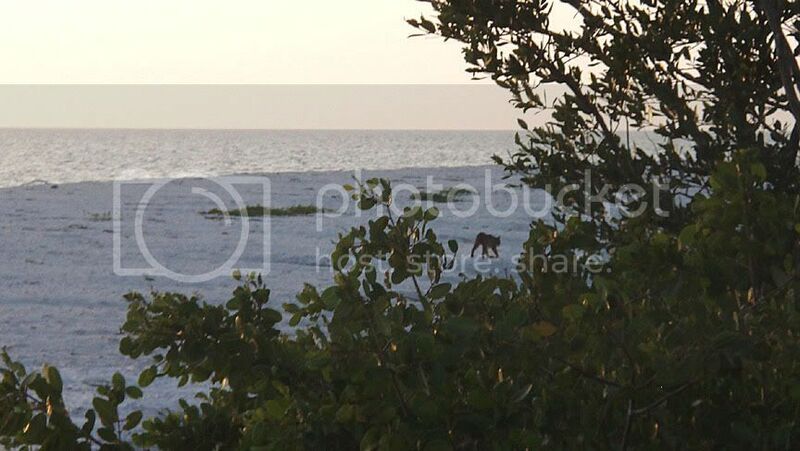 After traveling about 2.5 miles to the shelter of Lumber Key, I was amazed, surprised, and very happy to look back and see Lou 400 yds behind me. Later, when he said, "Thanks for waiting for me," I said, “I wish I could say I did, but that was the best time I could make.” We made the rest of the way into Chokoloskee without major problem. 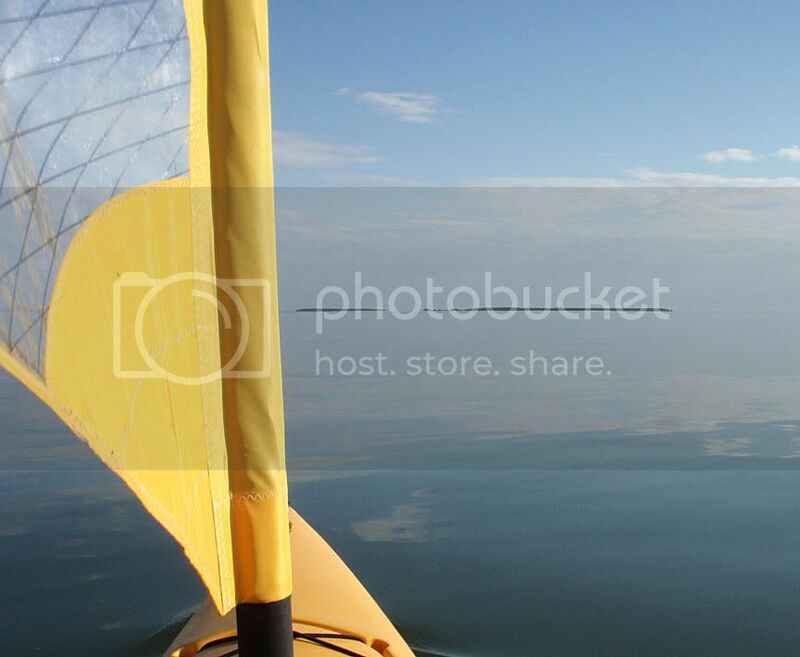 Personally, it had been one of the more stressful days of my kayaking and sailing life. 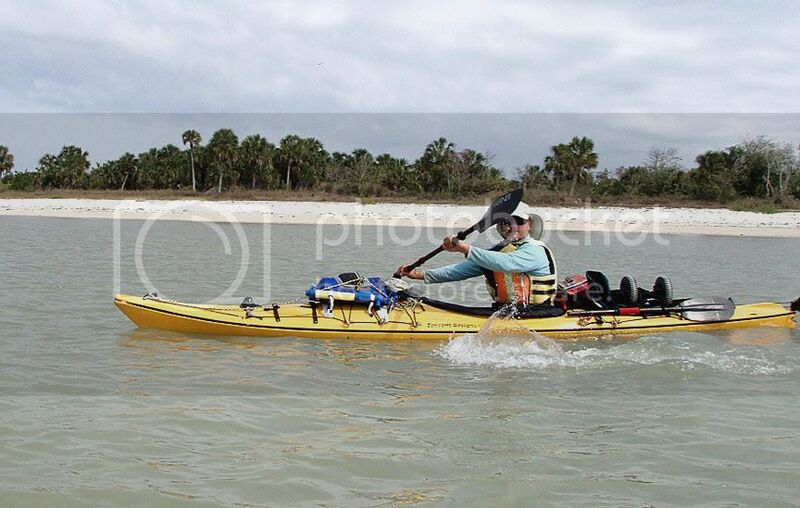 It was not so much my own safety—the Hobie AI is a very tough, reliable boat—rather, I was worried about my friend, Lou, in those punishing winds. Last edited by Chekika on Mon Jun 24, 2013 1:23 pm, edited 5 times in total. Great story. 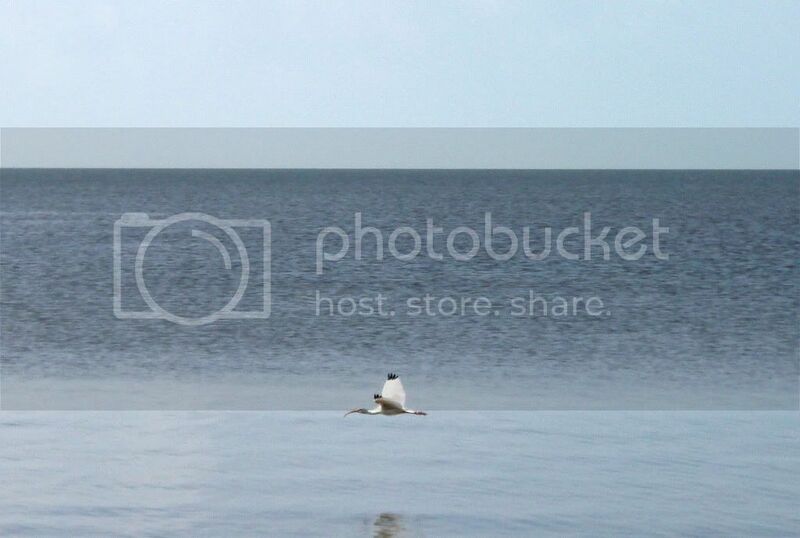 I really enjyed the pics. With the amount of sand around you I'm guessing that's what caused the leakage. 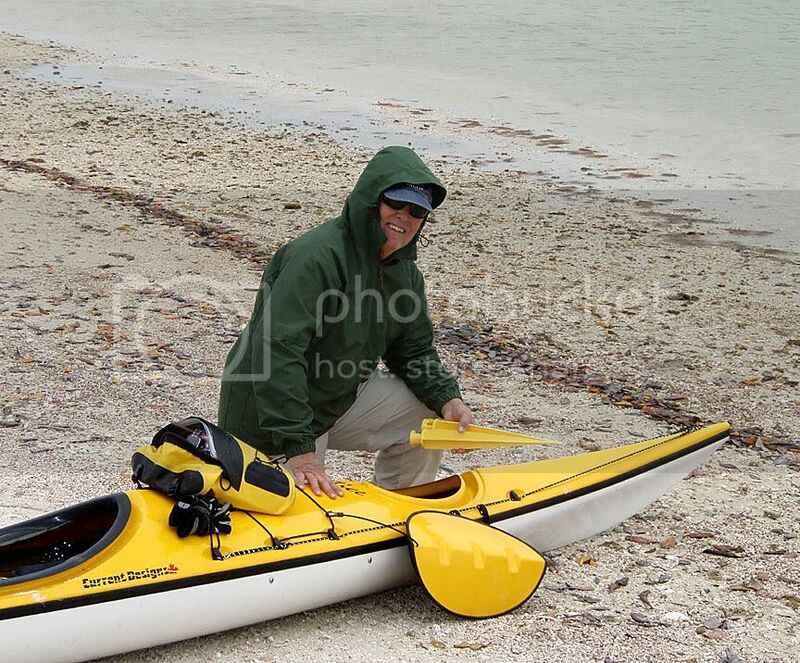 I've found I have to clean the O rings anytime I launch or land and even a slight surge washes over the yak. Thanks, Pirate and Dan. Such generous comments are always appreciated. 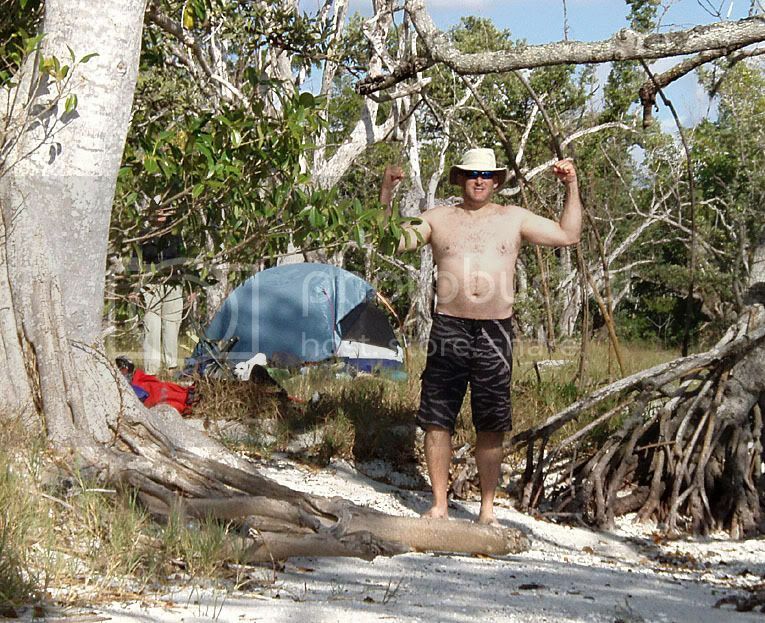 Pirate, those "stakes" are not used for his tent, they are used for the "parawing" (the tan parabolic shaped tarp you can see in some of the pictures). They must have sturdy stakes to stand up to moderate winds. They are serious "carnival tent" stakes which we find at Home Depot here in the States. Once we almost had a terrible accident putting up the parawing with heavy metal stakes. It was pretty windy. I was standing at one end of the parawing which was staked with a "ground hog" stake--12" metal stakes weighing about 1 lb (about 2 kilograms, I believe). 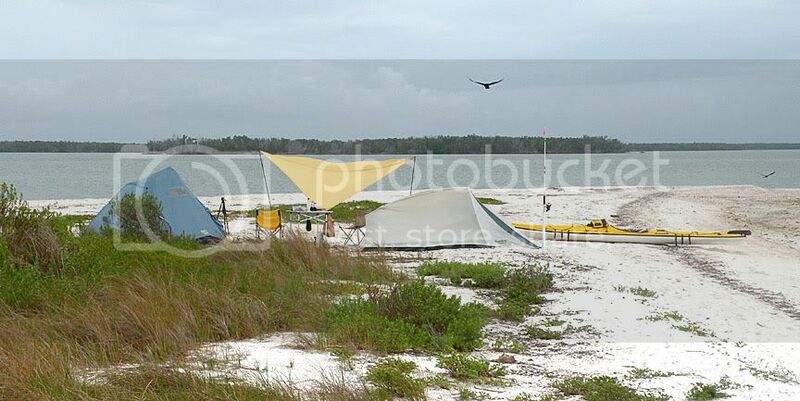 My friend, Lou, had just finished putting the stake at the other end, when the winds grabbed the parawing, pulled the heavy stake out at my end, and threw it at high velocity within 6 inches of Lou's face/head. As the tarp fell to the ground, he looked at me and said, "What happened?" He was unaware of the near catastropic event. 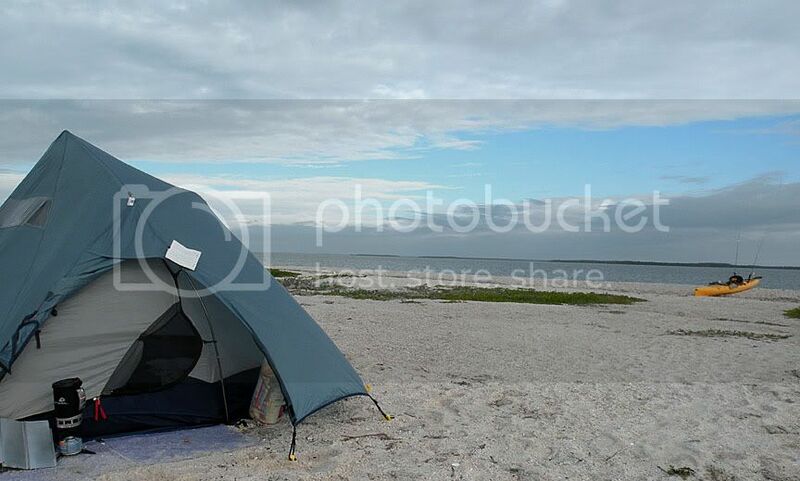 Because we usually camp on beaches, we do use 12-inch plastic tent stakes to keep our tents from blowing away. Wire stakes or Y-stakes will pull out in the serious winds we sometimes encounter. 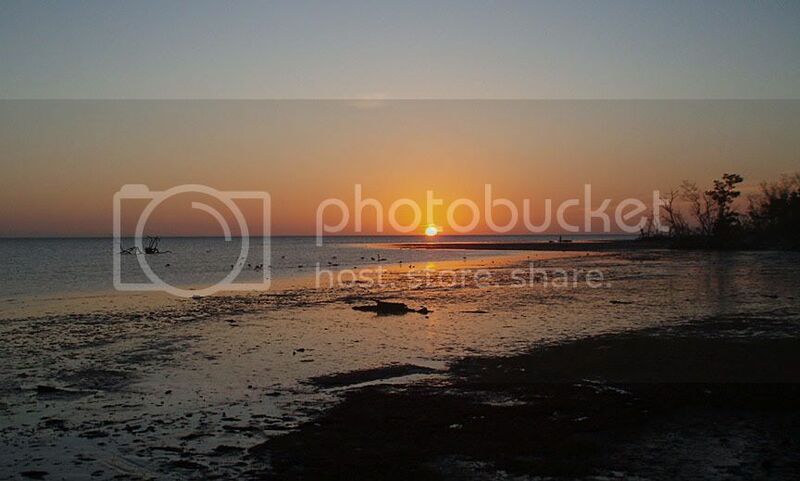 Last edited by Chekika on Sun Apr 26, 2009 9:53 am, edited 1 time in total. Some people have asked about the cooler I carry and how it is attached. 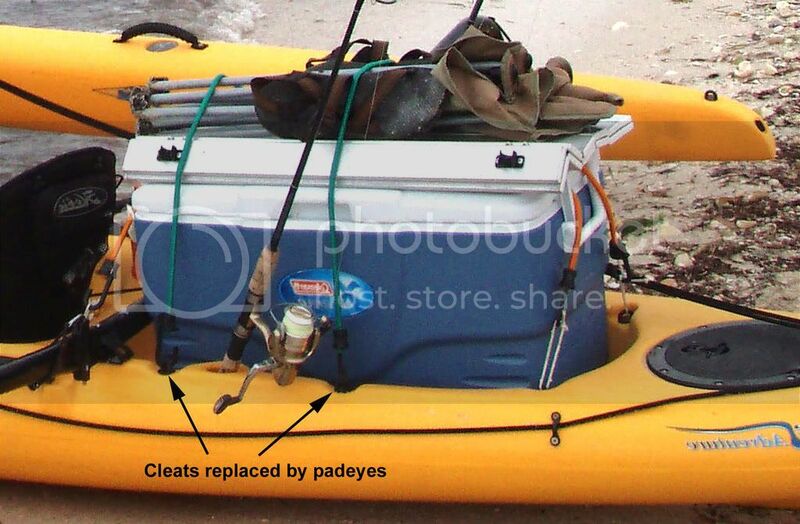 This picture shows the Coleman 36-qt Xtreme cooler w/ table top, chair, and sandals on top. The cooler is held by 2 40-inch orange shock cords running the length of the cooler and attached to the padeyes via loops. Then, the table top, chair, and sandals are strapped down by 2 green 34-inch shock cords running across the cooler and attached to padeyes. The padeyes have replaced the factory cleats at these positions. Nothing moves. 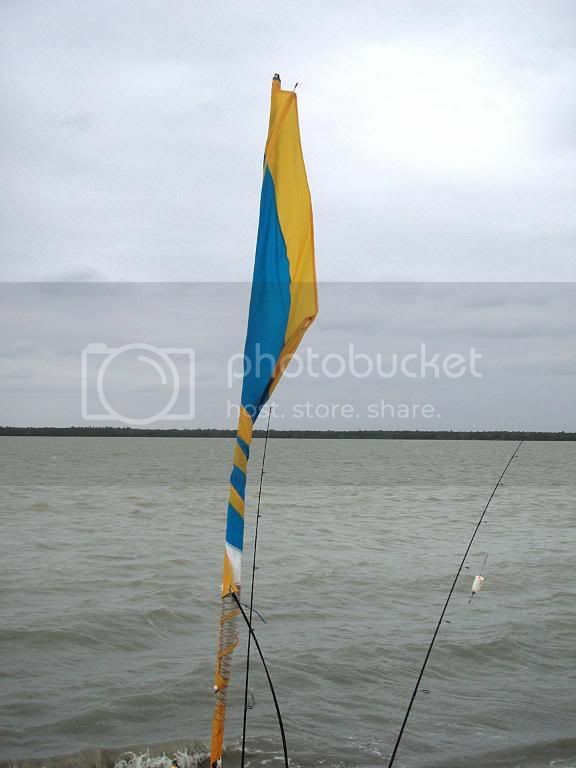 The rods do not interfere w/ the mainsail sheet when sailing. However, this picture is out of date regarding the rod holders. 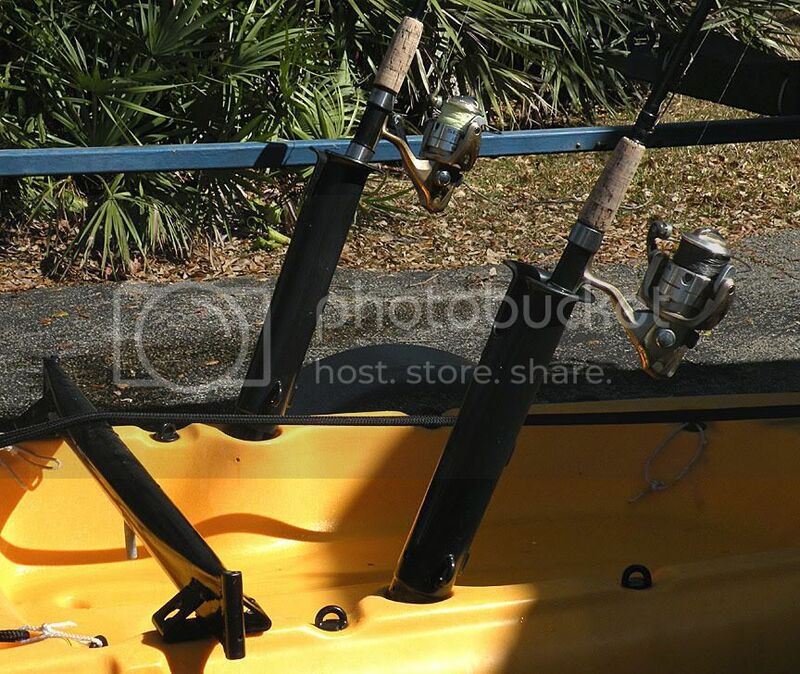 I am now using Hobie rod extenders. There are problems with the factory rod holders. (1) They are always full of water. So, on trips the rod handles are soaking in water continuously. 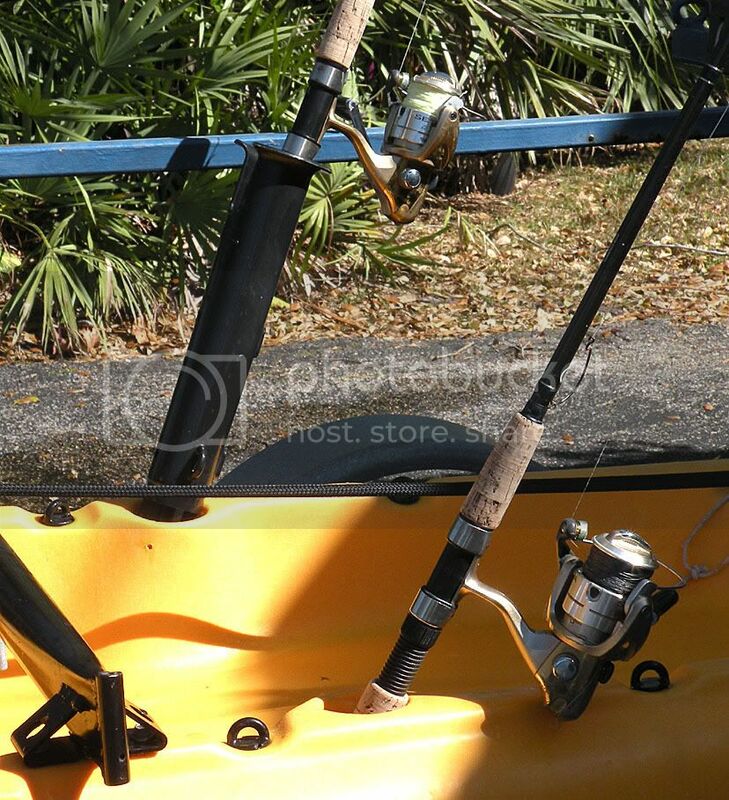 (2) More importantly, when you keep your rod in the built-in holders, it is only about 6 inches above sea level. 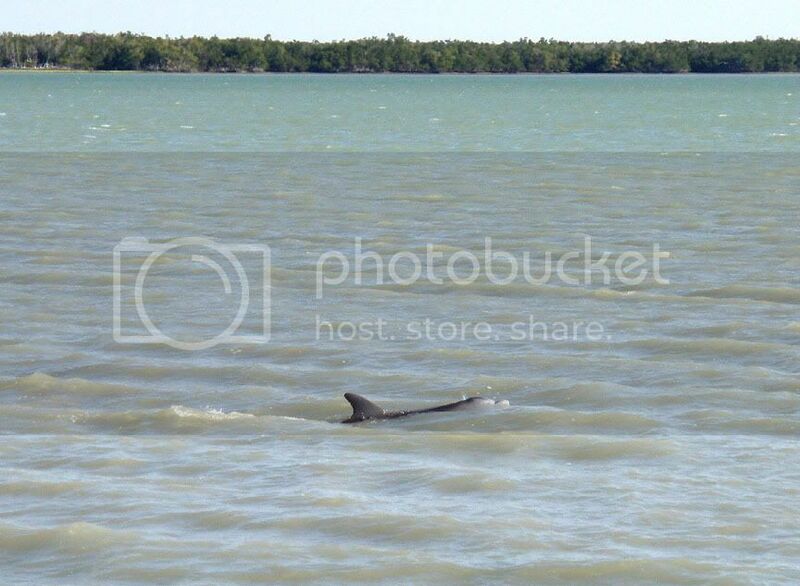 In even moderate seas, it is regularly doused with saltwater. This means extensive corrosion of your reels or extensive upkeep to prevent that corrosion—most likely it means both. Do these extenders affect my sailing? No. Last edited by Chekika on Sun Apr 26, 2009 9:51 am, edited 1 time in total. Great pictures, and a very well-written narrative. I've got an Adventure, and I also take on water through the hatches. I've got a pump that empties whatever gets in, and a collapsible "grate" that keeps my things a couple of inches above the kayak's bilge. Even without a lot of fish, it looks like it was a great trip. 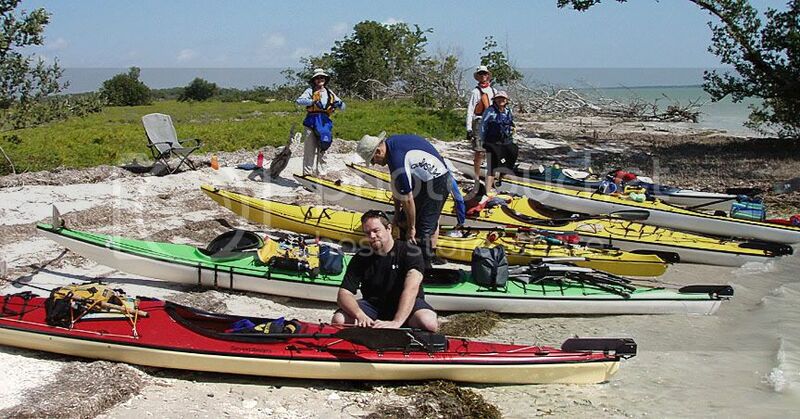 This full-paddle (no sailing) 7-day trip along the coastal Everglades had one of the more interesting first days ever. 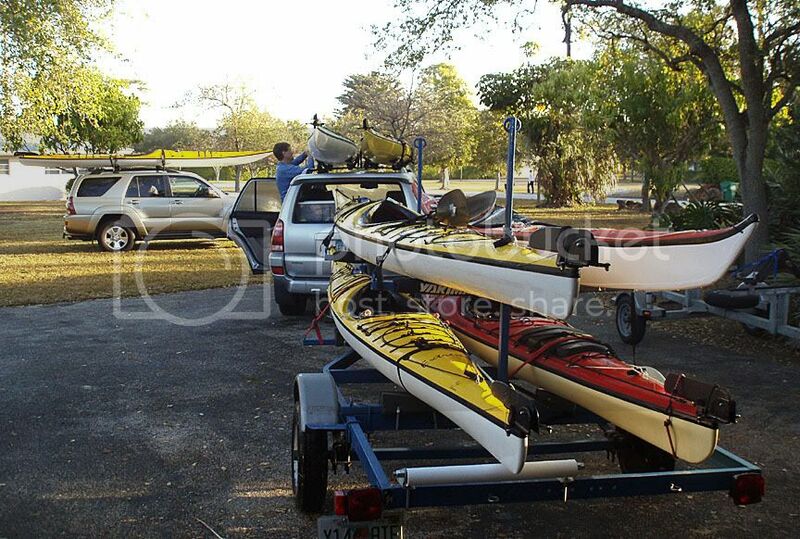 It began ominously at home when one partially loaded sea kayak fell off a trailer and broke its bow. Getting all the boats, gear, and people loaded was an achievement. But, everyone made it to the launch.... From left to right: Jon New, Erika Fitzsimmons, Pat Owen, Ivan Molton, Janet Lineback, Karl Bateman, Lou Greenwell, and Nancy Wellman. 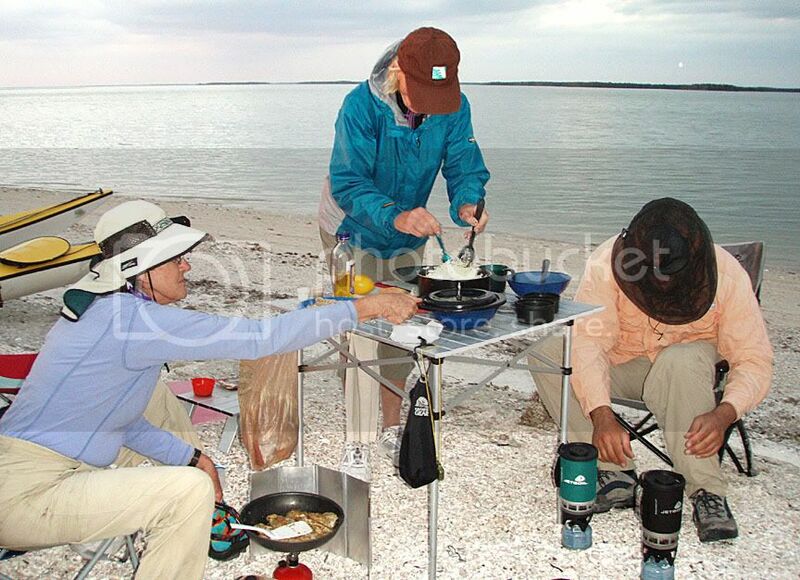 Jon, Janet, Lou, and Nancy have done this trip before. Ivan, previously a psychology grad student at U Miami, is now on the faculty at U Washington, Seattle. He was in FL for a meeting and fit in this trip. Karl is a snow bird from Canada. Pat is from Ft. Myers—west coast of FL. 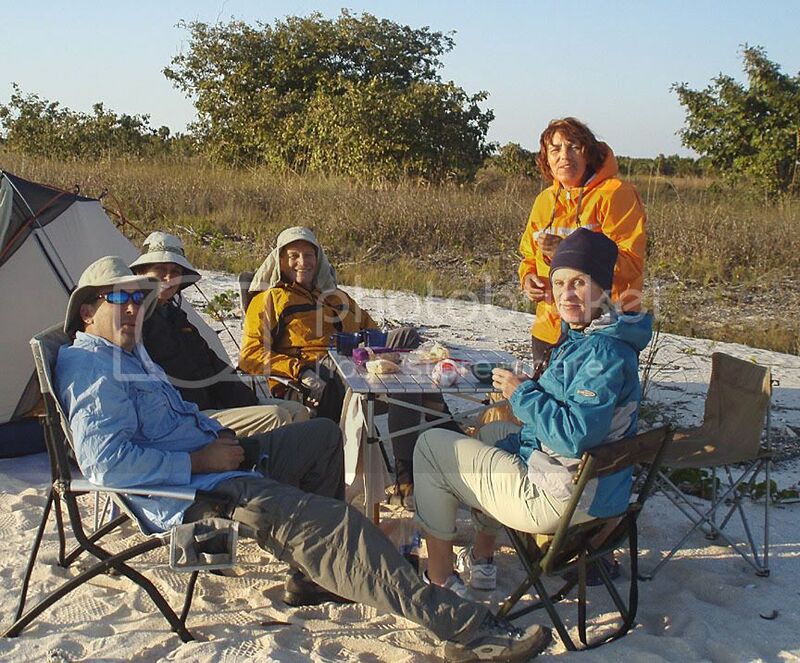 Erika has done several camp trips with us but this was her first "expedition." It seems we always meet incoming people as we leave Flamingo Marina. 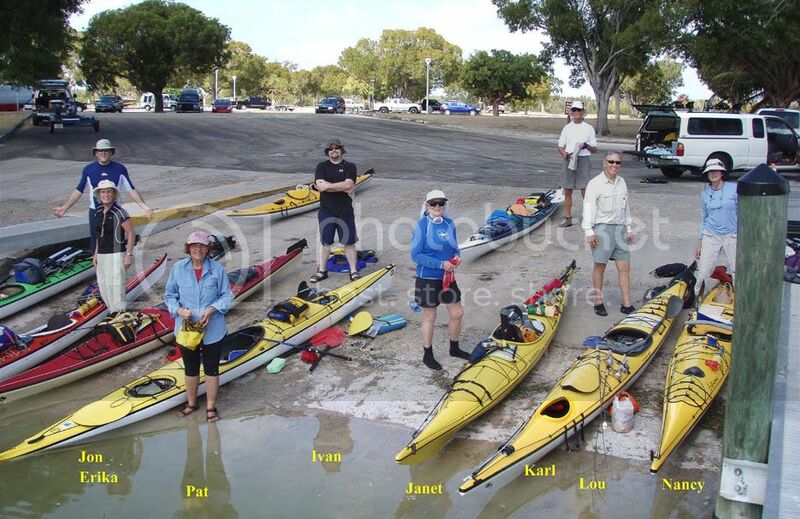 This year it was a group of canoeists who had been out for 2 weeks. Lunch break at East Clubhouse—we once ran into a 6’ Eastern Diamondback rattle snake in this area. 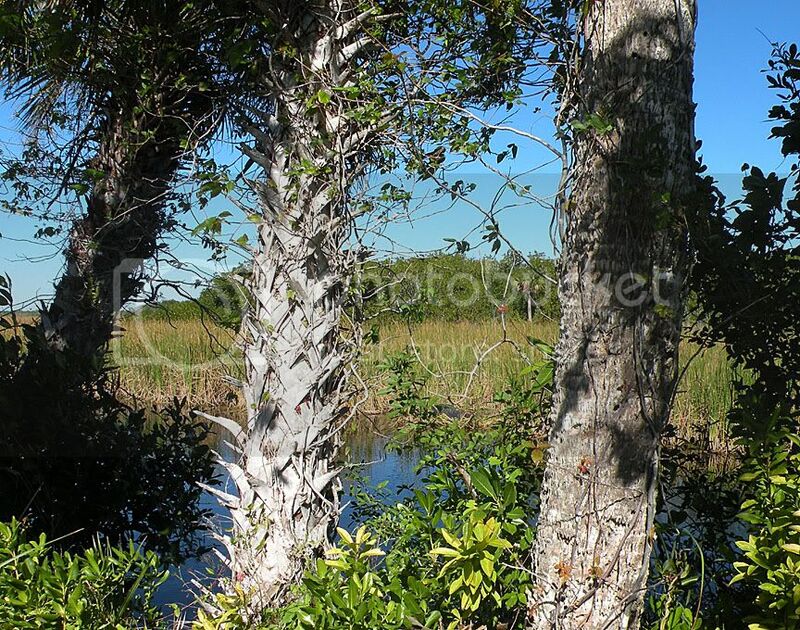 It was a surprise, since snakes are VERY, VERY RARE on coastal Everglades’ trips. 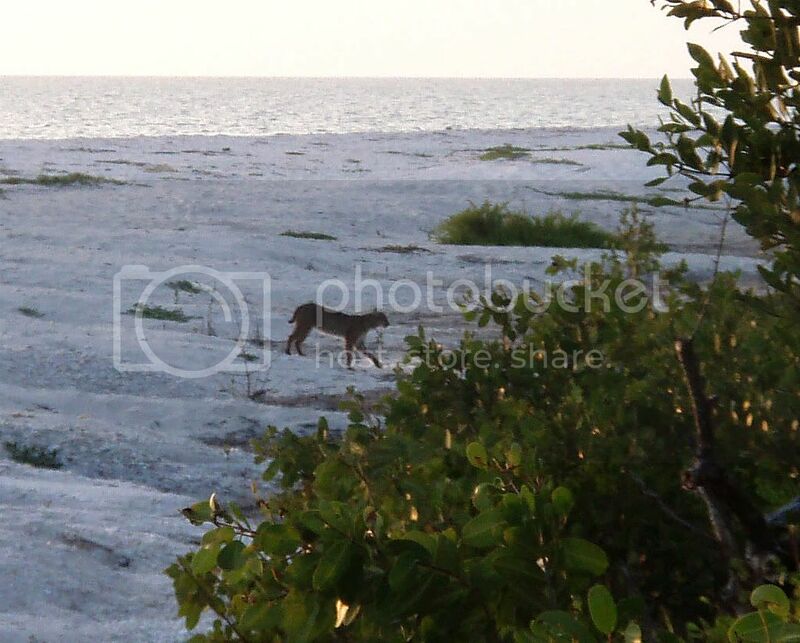 This first day we saw the usual assortment of birds, dolphin, and occasional turtles, but the sighting of the day was the BOBCAT. 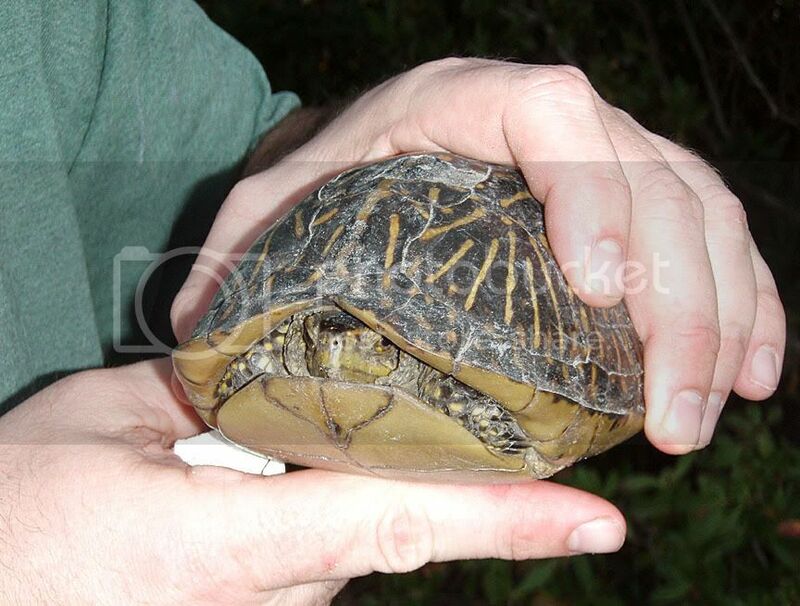 While we were following the bobcat, we found this land turtle. Dinner preparations—Pat, Erika, Nancy, and Lou. Lou would return to Flamingo tomorrow. East Cape Sable can be as alone as you could ever want to be. Overnight raccoon attack on a hatch destroyed rubber gasket. The first 24 hrs were interesting indeed! On day 2, we encountered tough headwinds from a cold front which passed during the night. 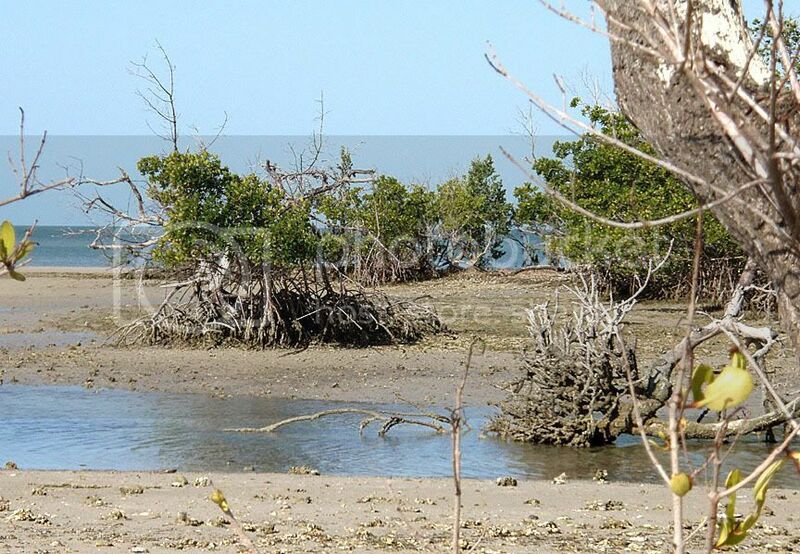 Starting at NWC, the shoreline north suffered through a couple hurricanes a few years ago. 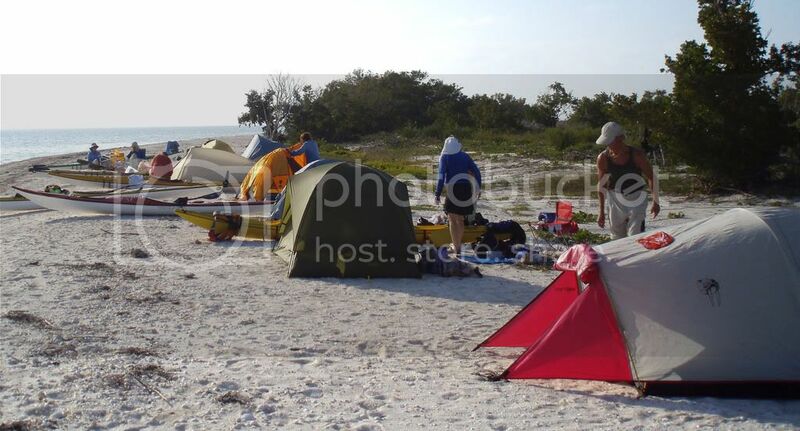 An illegal fish camp--$75 fine if caught by Park Rangers, AND they may be asked to clear out, even in the middle of the night. Lunch stop on way to Graveyard camp. Karl cut himself badly on a can of sardines. Ivan is in attendance. 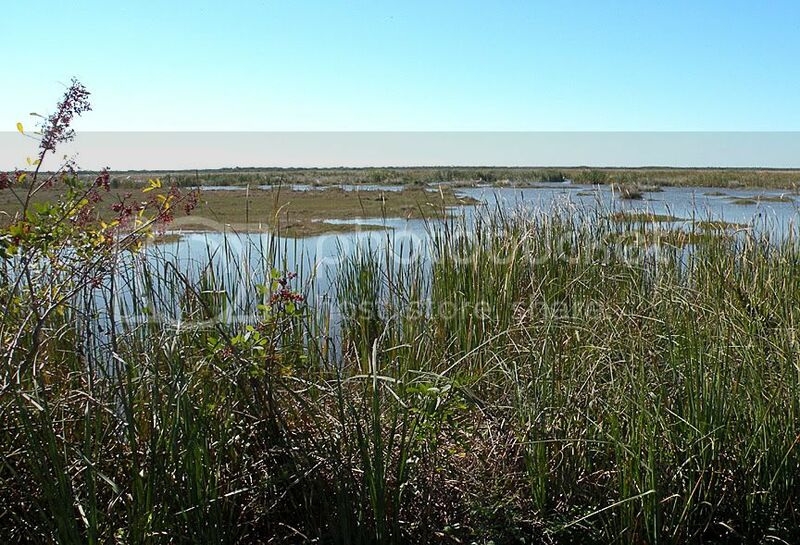 We have landed on Everglades’ muck as there are no beaches in this area. Sundown at Graveyard▬birds, mostly ibis, poking in the muck. Those from Seattle, who have not seen the sun for months, like to relax and soak it up. 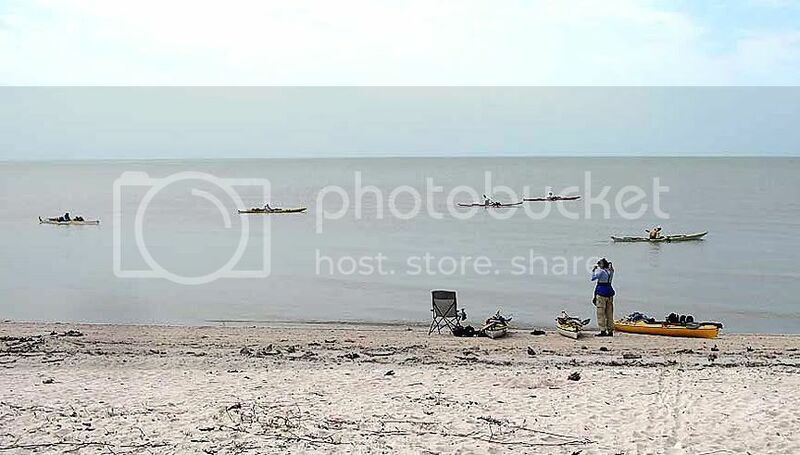 As we moved along this shoreline toward Highland Beach, we picked up a radio communication from paddle friends Alex Oancea and Natasha Pyle. 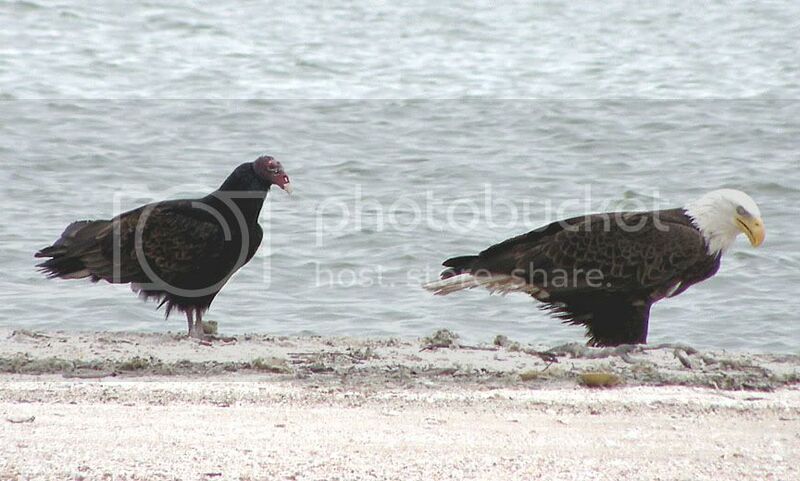 They were doing a loop from Chokoloskee and planned to meet us today at Highland Beach. 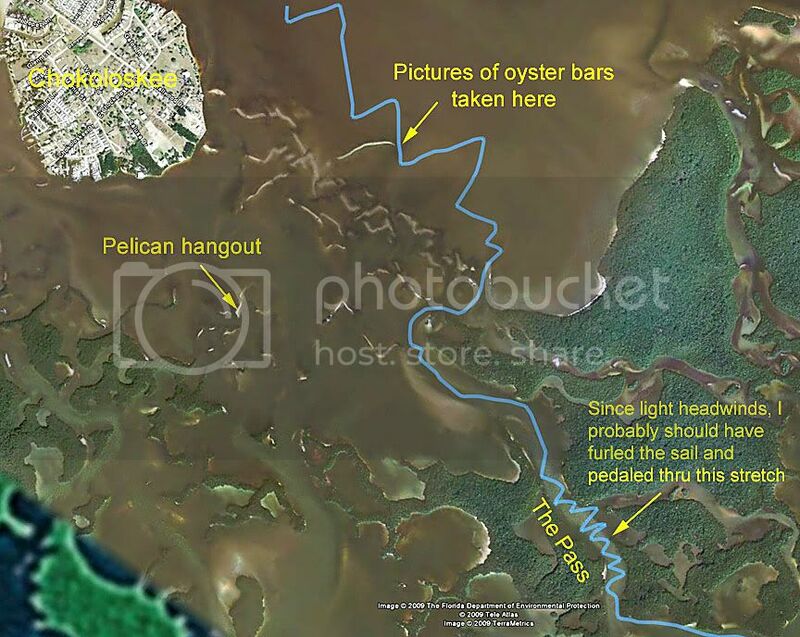 The image shows Natasha’s GPS track. The inland part of this track follows the Wilderness Waterway—a “deep” water route that permits small powerboats to avoid coastal waters. 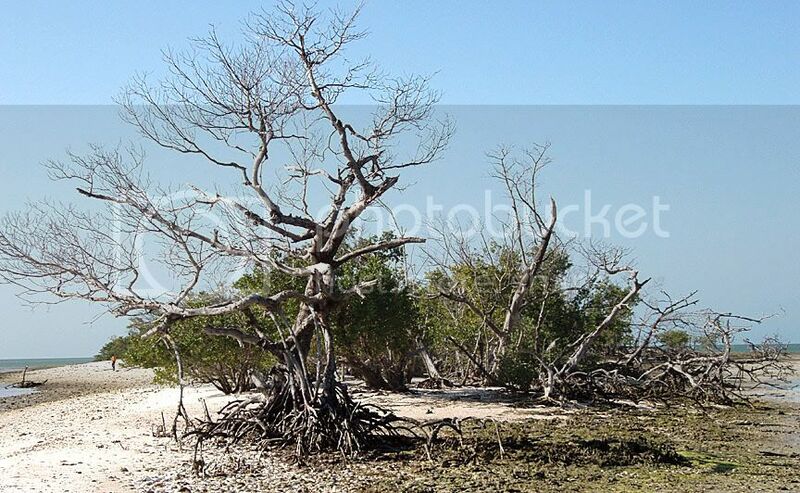 There is a notorious section called “Nightmare” because it was very difficult for powerboats to navigate the shallow, root-lined, downed-tree passage. 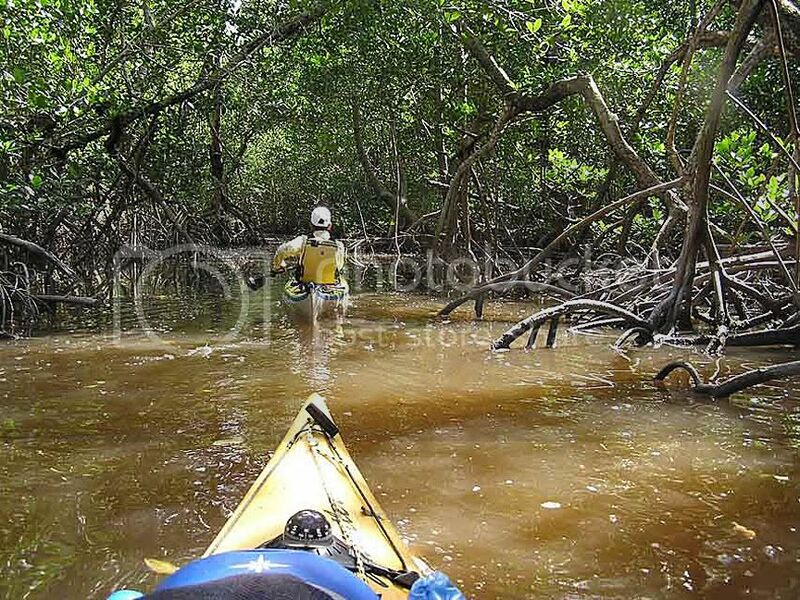 It is pretty much impassable by powerboats today, but kayakers and canoeists can do it without problem. 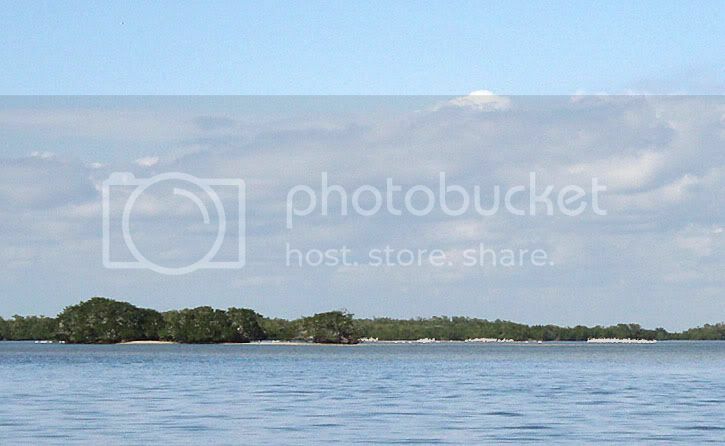 It is frequented by large tarpon in March—they can give you a bit of a start when they “roll” next to your boat. Alex took this picture as he and Natasha negotiate the route before linking up with us at Highland. Leaving Highland Beach—our group is now 10 people. 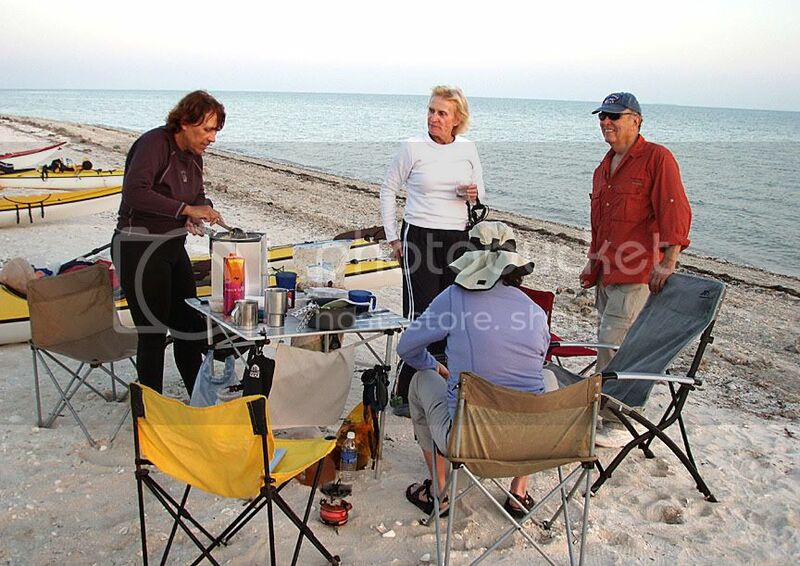 Janet, Alex, and Nancy enjoying a break on Hog Key. Within a few feet of where we sat on Hog, I found the following tracks (not to size): deer, raccoon, and bobcat. New Turkey Key is beautiful. Here are pictures showing its many facets. 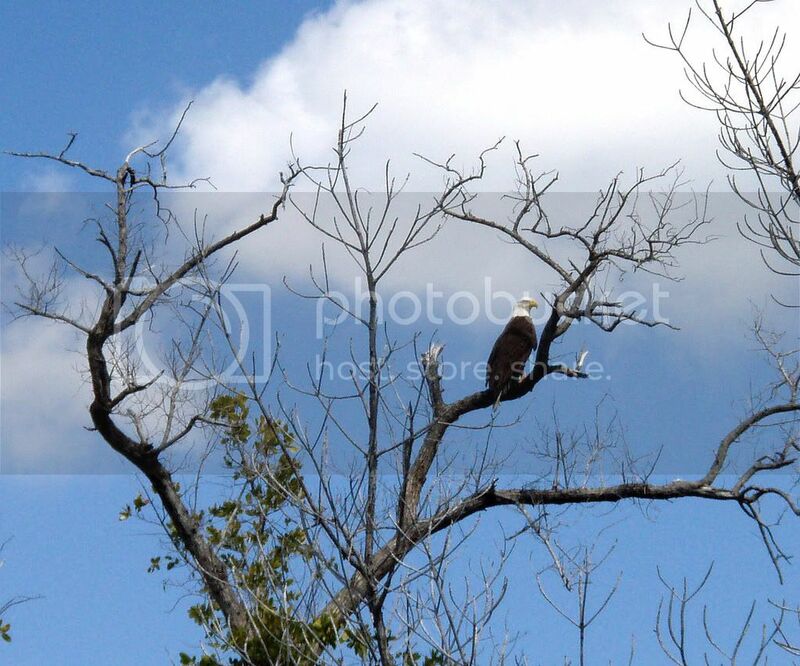 A lone bald eagle lives on a small island near Pavilion Key. 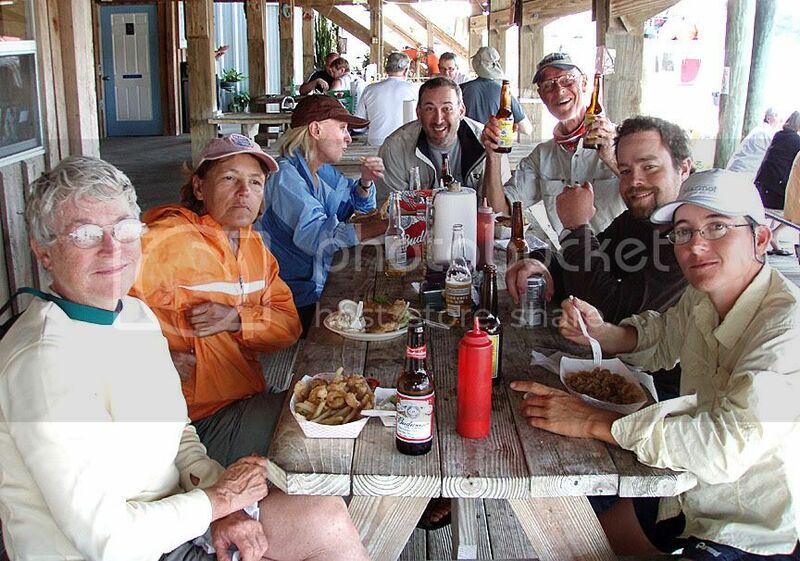 Pavilion Key is traditionally a fish-fry night. Dinner preparations are under way—Nancy fries fish, Erika prepares an Alaska salad, and Jon handles 2 Jet Boils for mashed potatoes. Cookies/chocolate covered cherries for dessert. This is our last evening and all the bag wine will go tonight. Ivan contemplates an oyster bar—and reverses direction. The Landing—after high-fiving all around, we load up. No leaks in the hatches! Only 1 serious raccoon attack; only 1 accident—Karl’s cut fingers; only 1 tough day against strong headwinds. Perfect temperatures: 50s at night, 70s daytime. (i.e., about 13oC, 22oC) Fish sandwiches 1 night, fish fry another. All the usual sightings: dolphin regularly, many birds, turtles, occasional shark, one 100-lb tarpon at the end of my fishing line (that was exciting—for a few seconds), and the bobcat. 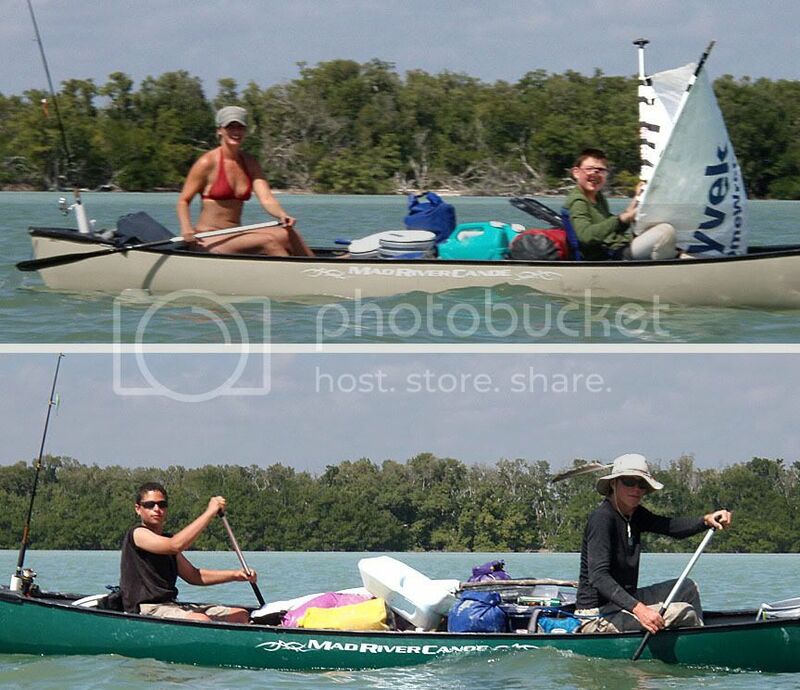 Comparison of this paddle trip with last year’s AI trip: A paddle trip is harder—break camp every day, make camp every day, paddle 8-14 mi every day. With the AI, we had 2 fishing rest days during last year’s 7-day trip. Because of the AI’s ability to put on many miles in a day, it allows a more relaxed trip provided the winds cooperate. 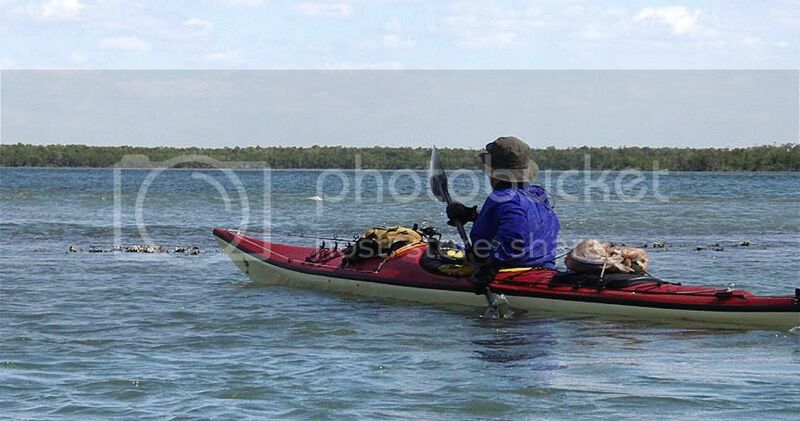 On the other hand, you see more when paddling a kayak. 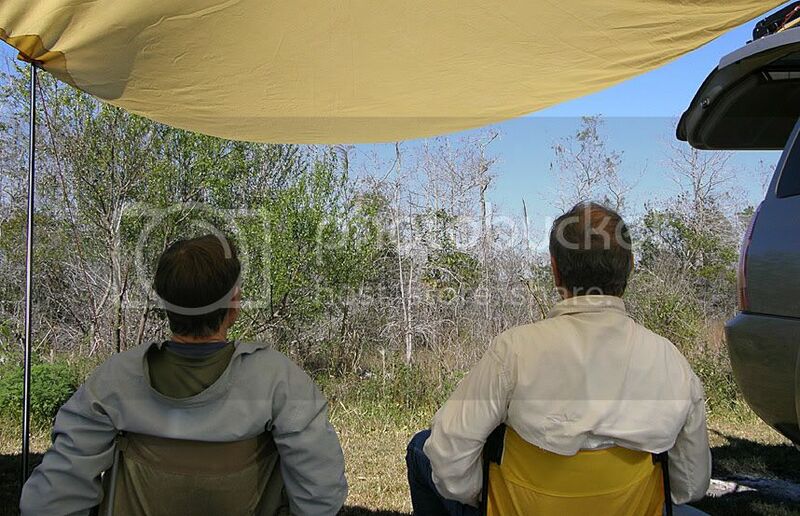 You camp in a different spot every night. 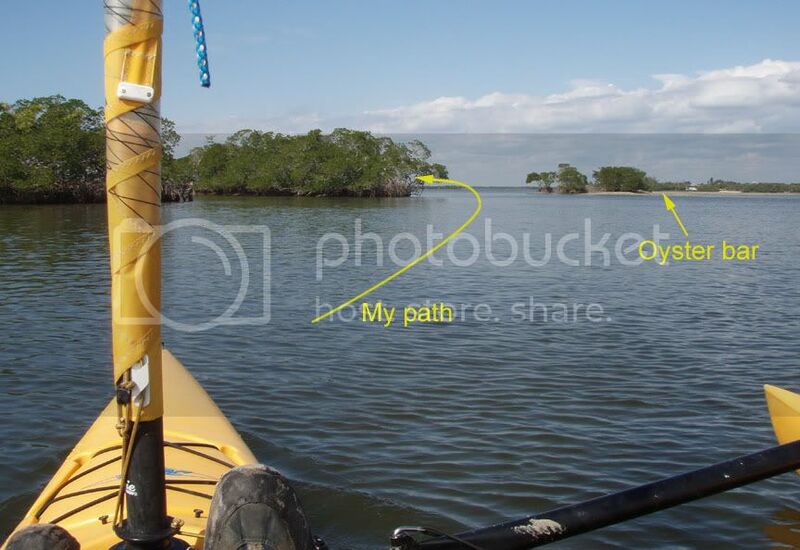 When paddling, you are often near shore or within 1 mile. On the AI, you may be 2-3 miles off shore. 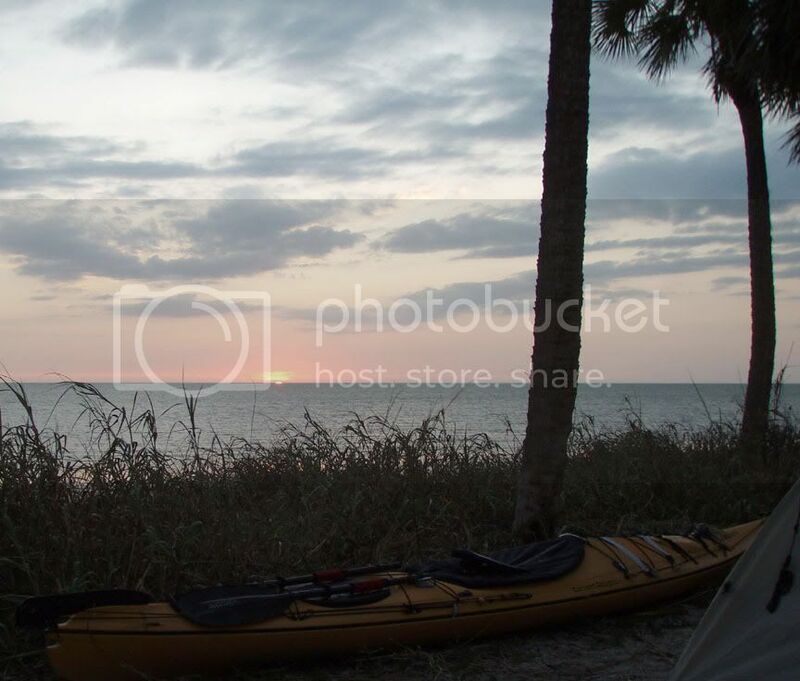 From a kayak you can fish the shoreline easily. 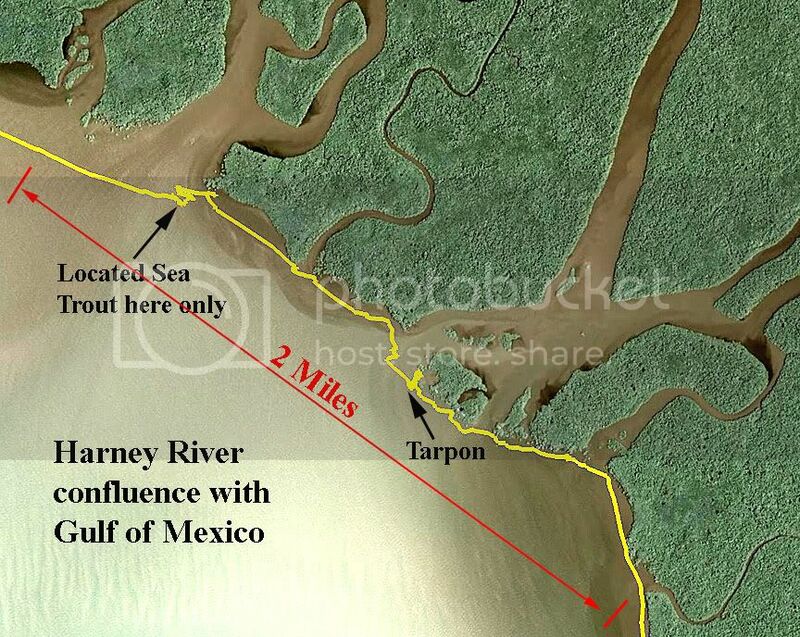 This Google Earth image and my track (yellow) show how I fished the shoreline of the confluence of the Harney River with the Gulf of Mexico. 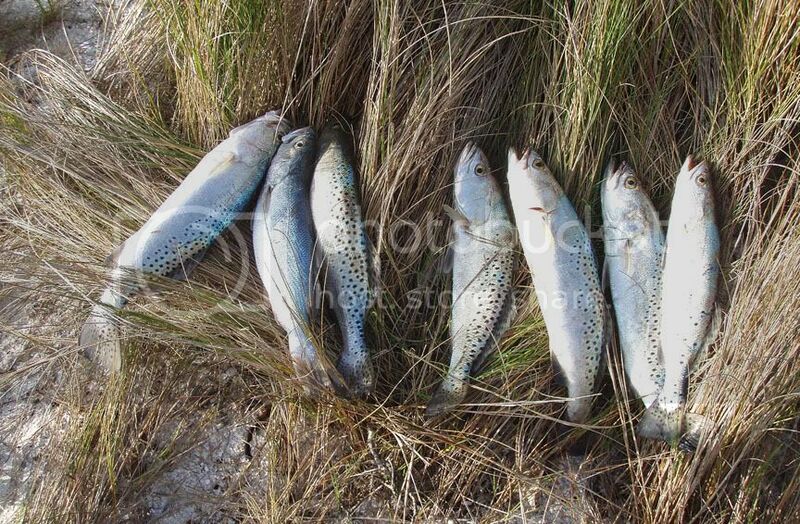 I and my fishing partners had success only in the area indicated. This type of shoreline fishing would be inconvenient (but not impossible) in an AI. Of particular note was, while trying to catch dinner, I hooked into a 75-100# tarpon. It only lasted a few seconds, but it was exciting. 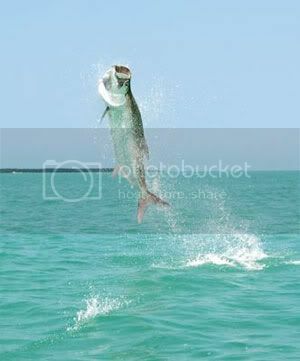 The tarpon picture is from the internet, but it gives you an idea of the acrobatics these fish perform. Last edited by Chekika on Mon Apr 27, 2009 5:12 am, edited 4 times in total. I'm way late replying Keith but sitting here late at night with a force 7 and rain pelting against my window, I'm delighted to read your about your great adventures and photographs. Nothing short of inspiring. Well done. When the weather improves, I'm going to have to share an adventure with you. We have a large bird colony off a lighthouse here and that's my first trip. I've done it minus the camera but I'm working on that. Keep up the great work and thanks for being so generous with the information. Better to be a live donkey than a dead lion! my GPS tracks on Google Earth. For your info: the newest Google Earth allows import of GPS tracks free. The track file has to be in 'kml' format language. http://www.gpsbabel.org. It translates my GPS tracks with just a couple of mouse clicks. a 3-D roller coaster, showing both location and altitude. planning where I want to go.